Quilt finished at long last! It has been a long time coming, but toward the end of my first burst of holiday time I finally got a proverbial wriggle on and made some serious quilt progress. 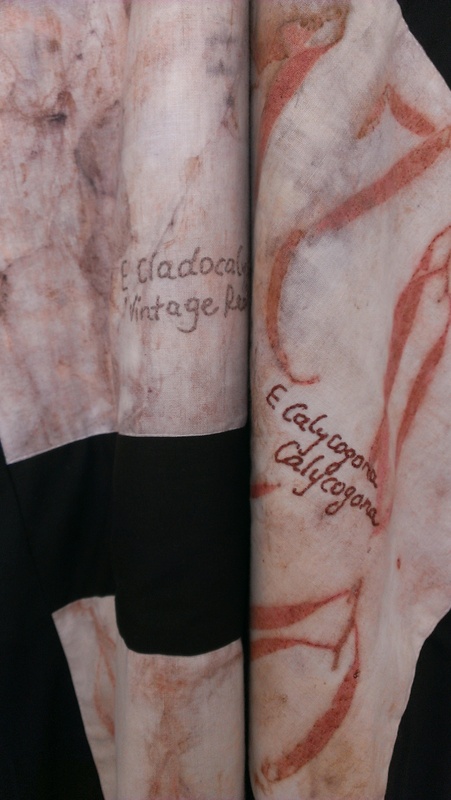 I have created a series of blocks that each showcase leaves from a specific eucalypt, and embroidered the name of the eucalypt onto the block with eucalyptus-dyed silk thread. Who knew I had it in me? I thought I had decided against embroidery as a child, never to go back. 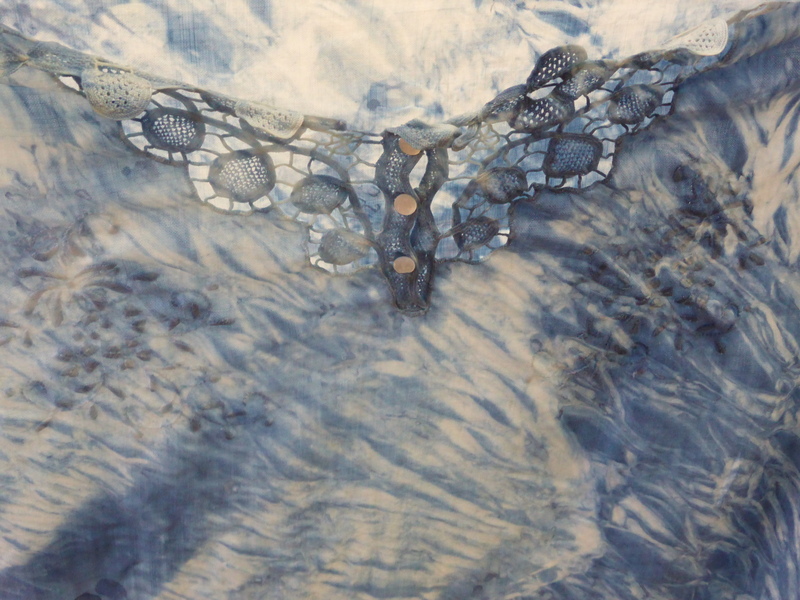 I tracked the old posts on this project because I wondered just how long I have been working on this quilt (or not working on it, which is the routine case, of course!) 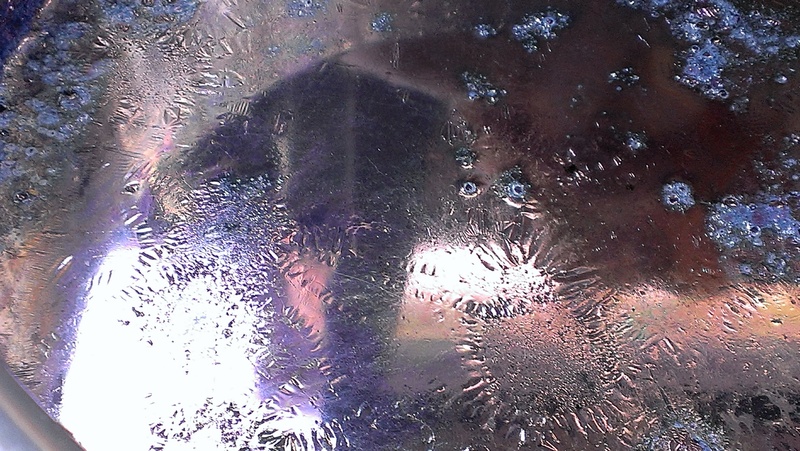 Just between you and me, this post in July 2013 is my first intimation on the blog that this project was in my mind. Blocks sitting waiting for courage here. Blocks finished here. Sashing attached with help from a visiting friend here. Dyeing the border here. Back finished here. Finally, it was assembly time! Here is the back, pinned out flat on the floor, wrong side up. I love the wrong side. Of most things. 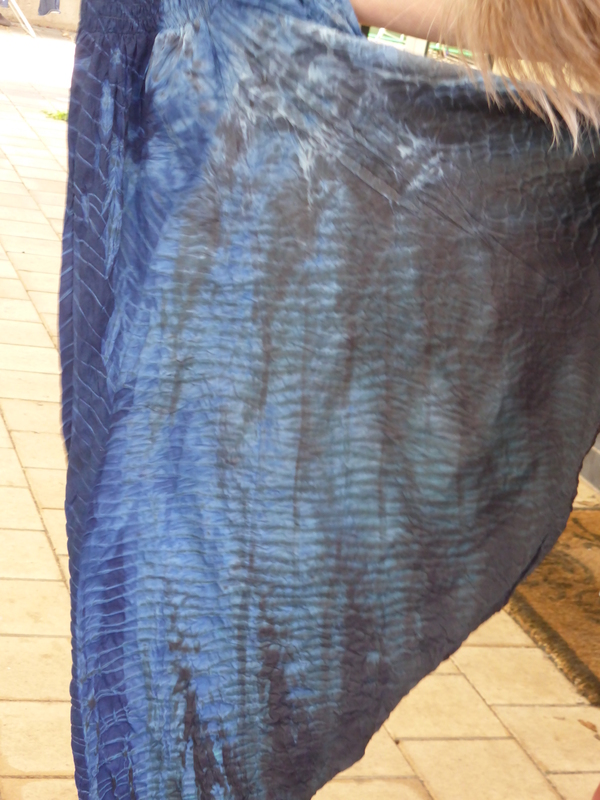 The back is made of a mix of recycled, inherited and thrifted fabric. 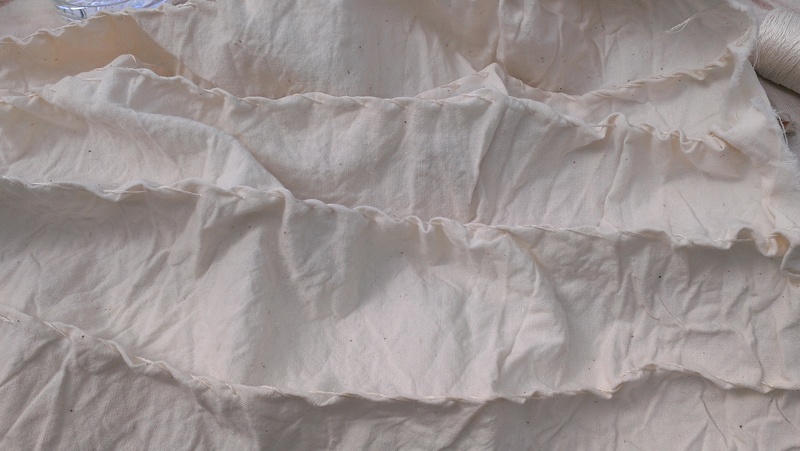 Next, the minimal batting option for women of a certain age in a warm climate: an ancient flannellette sheet, well past its prime. It’s hard to tell it was ever blue now. 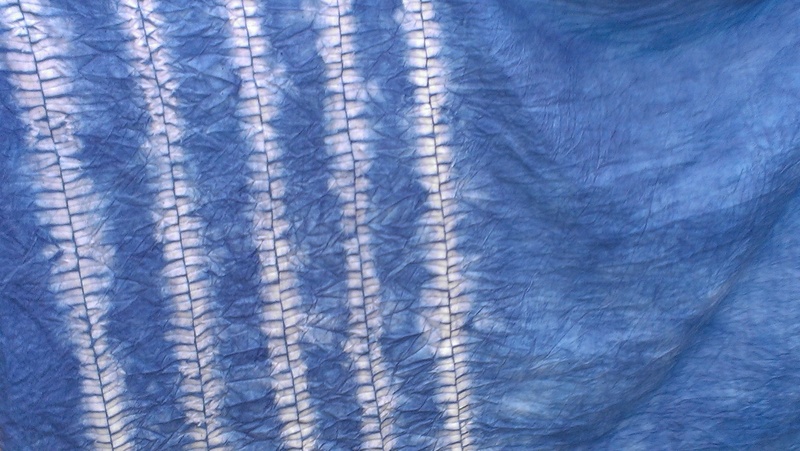 I do understand bias binding, and there are places for it, but I can’t see the point when binding a straight edge, so I went with on-the-grain binding and contrary to the instructions, sewed seams straight across at 90 degrees (okay, it creates less bulk to use 45 degree seams–that part, I concede). 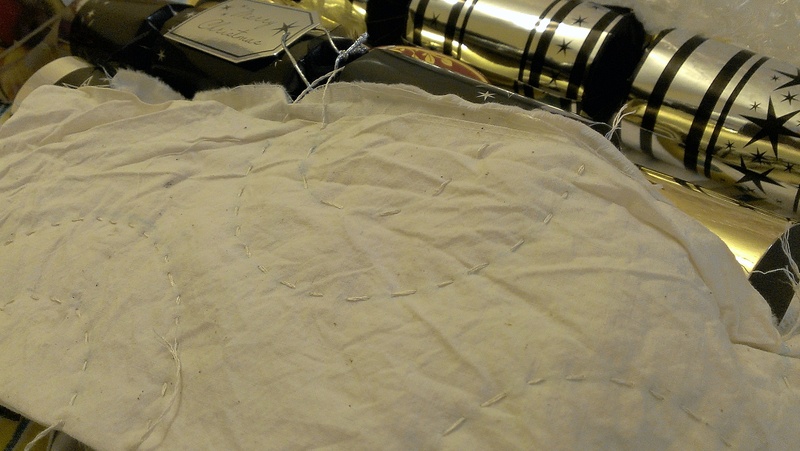 I made an exception when I had a moment of curiosity and finished with a lovely 45 degree seam–seen under sewing-machine-mood-lighting below. Because who needs seams that match? Maybe next time I’ll give all the binding that treatment, you just never know. I followed the instructions for mitred corners. Simple and effective! Much better than my own past efforts at reverse engineering without instructions. Done! 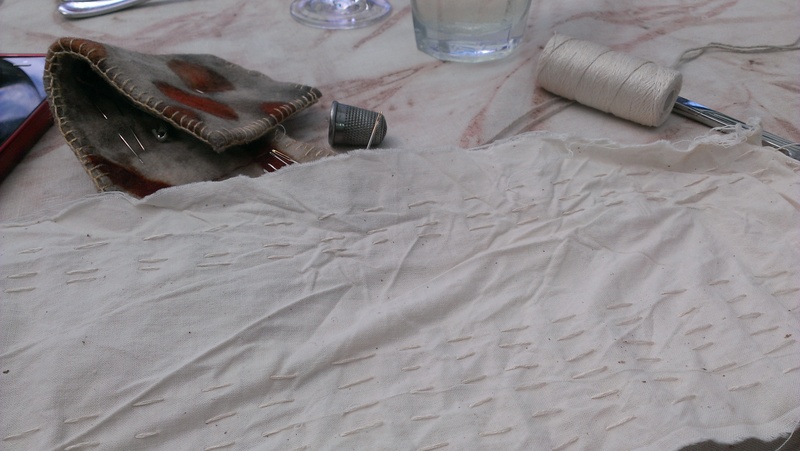 Apart, that is, from the metres and metres of hand stitching required on the back. And here it is, midsummer! But all such jobs come to an end, and now, finally, I have a quilt I love. I am surprised by how much I like the embroidery. It just glowed in the sunlit window the day I tried for pictures. I like all those blocks with their Latin names and motley prints. 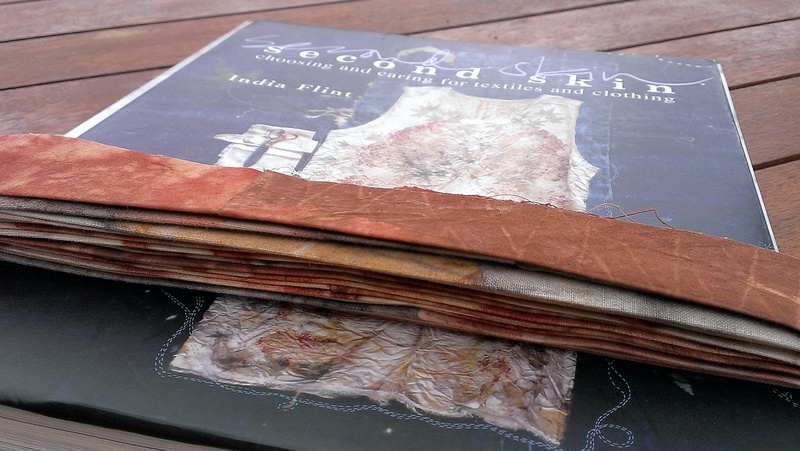 And I like its all-over-leafiness and the nicely bound edge. I expect this quilt will be a companion for many years to come, and this is such a happy thing! 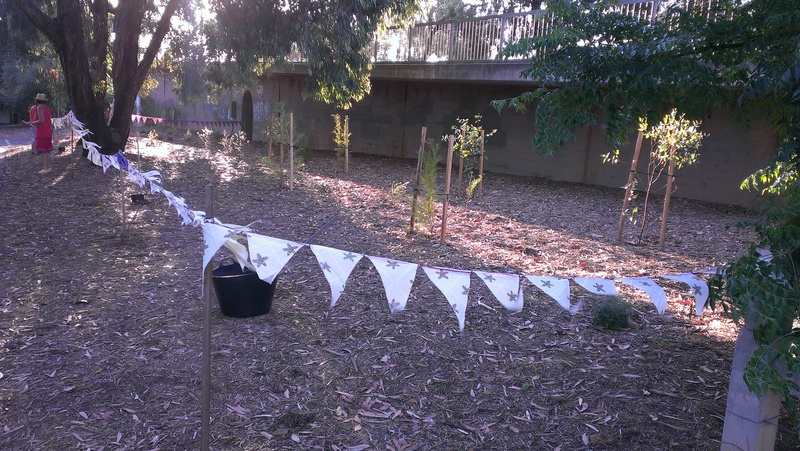 I have been tidying up the bunting we set up to protect recently planted and small native plants as I pass, adding a few pennants and re-tying after wind and rain. I am surprised it has lasted so long. But there are other plants in need of protection. A woman had a long chat with me as we each tried to figure out what to do about cars parked in ‘the garden’, as she put it, in another nearby newly planted patch. She confided that there was bunting across the way and it was wonderful and effective and she wished there was some in her street. I confessed I’d made it and explained how in answer to her questions. She asked for some. We discussed the council and what we might be able to do. I encouraged her to call them. 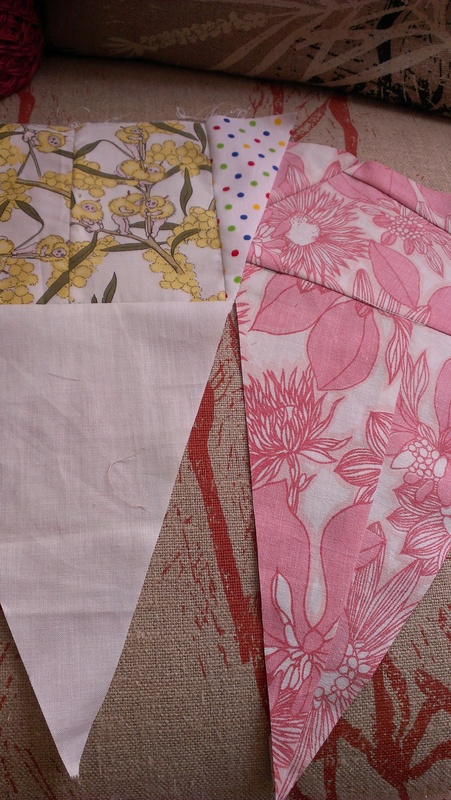 In the end, I made some more bunting. It’s low-fi bunting, this. 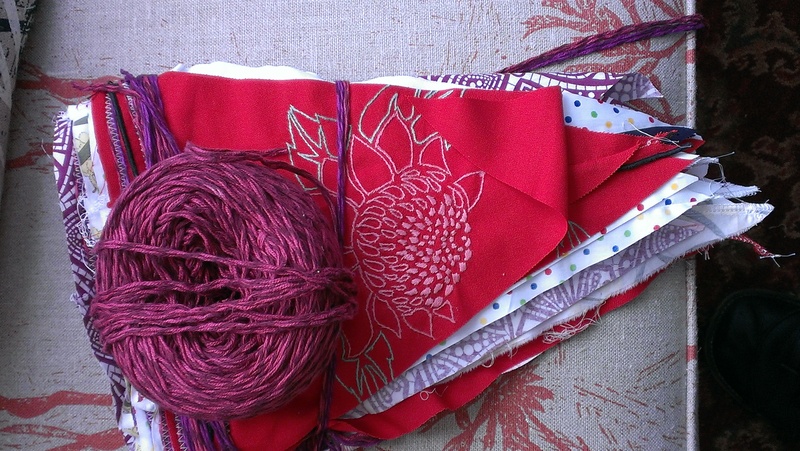 I have made some that is labour intensive and lovely, but in the case of bunting that suggests people should stop going where they feel entitled to go–through experience I have learned that sometimes metres of it will be ripped down and vanish in a single night. I’m not up for that when I have spent a lavish amount of time and care. 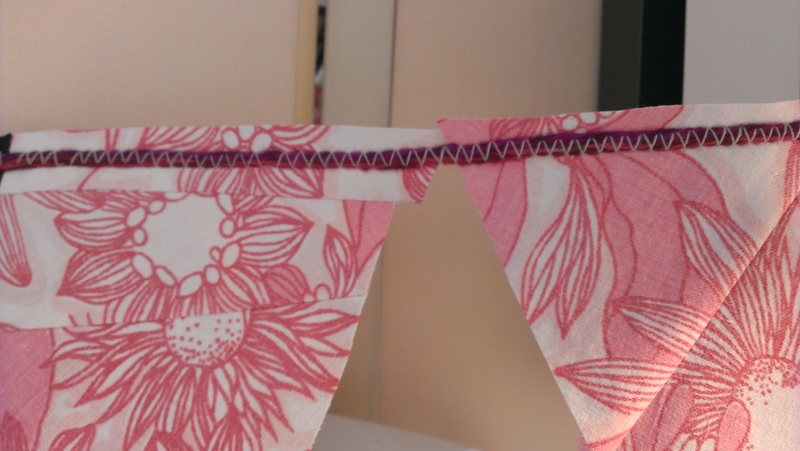 This is bunting made from scraps, with minimal effort. I piece together little bits, and don’t worry about grain and such. They just need to flutter in the breeze and offer a tip that this is not a parking bay. Drape is not a big concern! My very patient beloved agreed to come and help me put it up. And here we are, admiring our handiwork as the sun goes down and passersby come past with their dogs, too polite to ask. As you can see, the plants we are trying to protect are still small. Those that haven’t already died must be hard to see from a car. 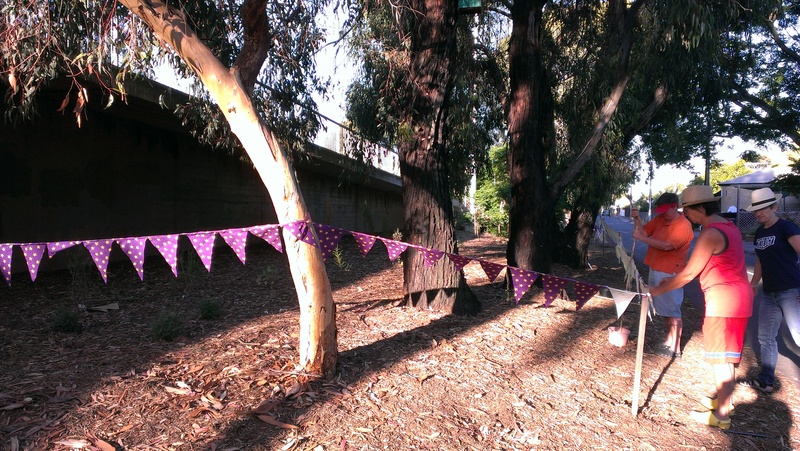 There is still another spot near here where people park… so there may yet be more bunting! More workshop preparation: batts, batts and more batts! 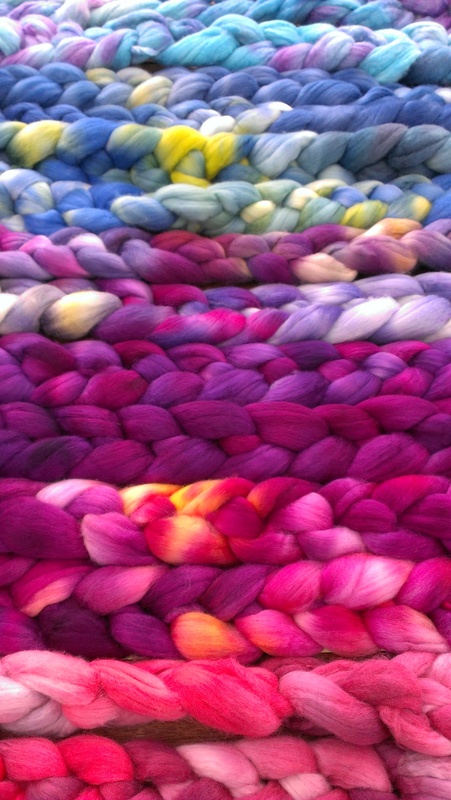 I spent a lot of hours recently creating batts for my spinning workshop. 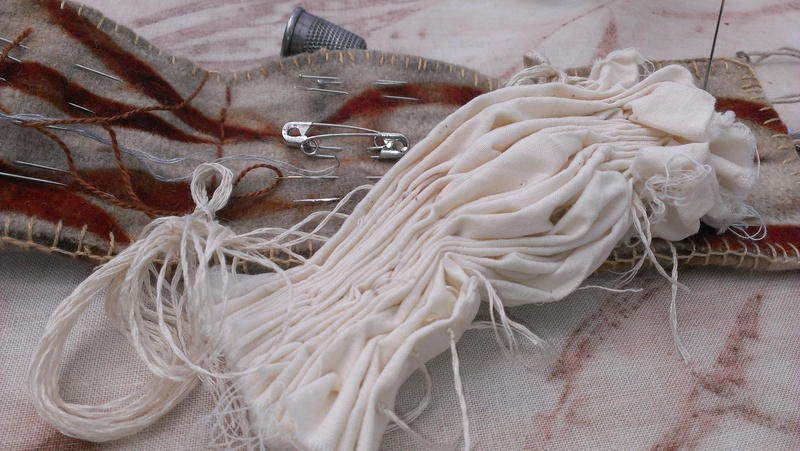 I had all kinds of bits and bobs, some gifted from Guildies, some fleece washed and (sometimes) dyed right here at home, some from here and there and all over the place. 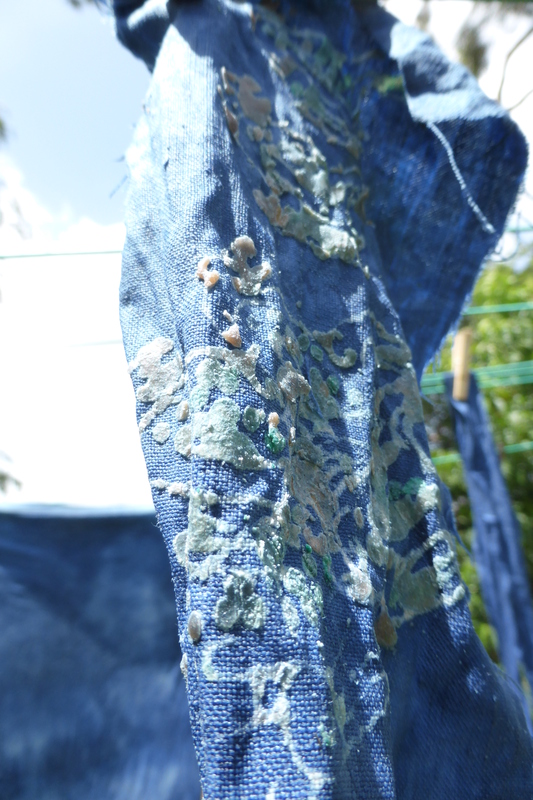 Even recycled sari silk. 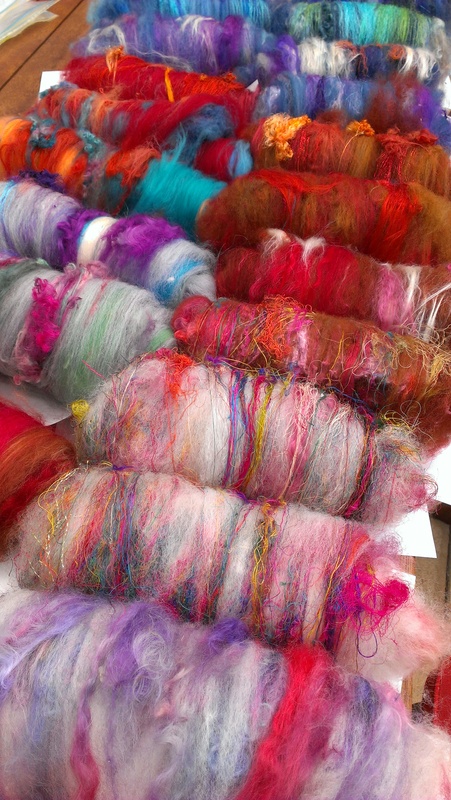 And then some based on merino and crossbred roving from the Guild trading table in all manner of wild colours. 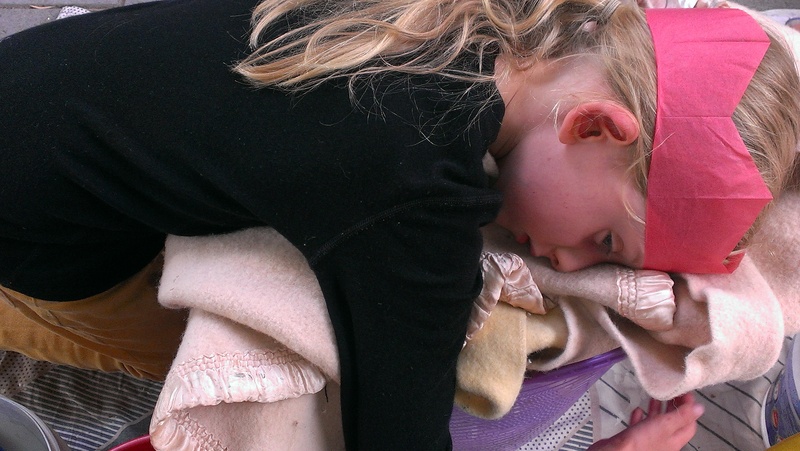 The pile kept growing…. 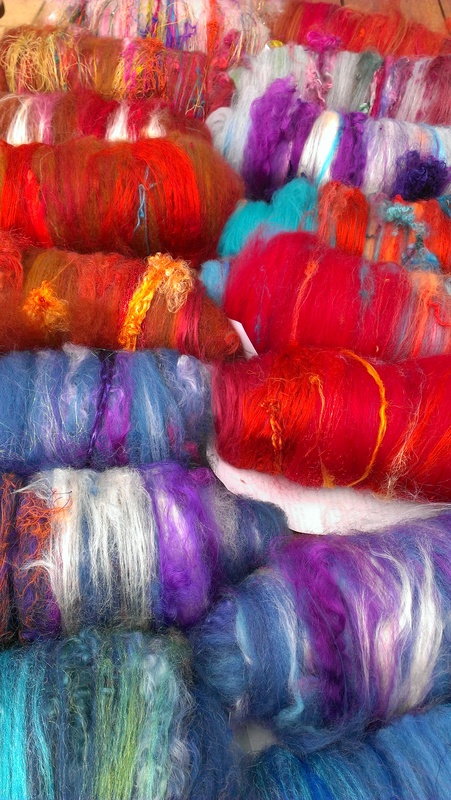 I have been preparing for a spinning workshop at the Guild, and the time came to dye materials for the class. 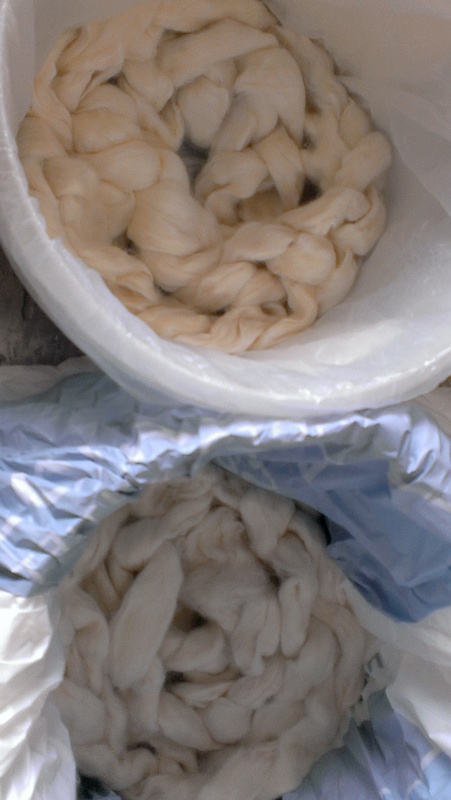 I weighed and measured my merino braids and soaked them overnight. 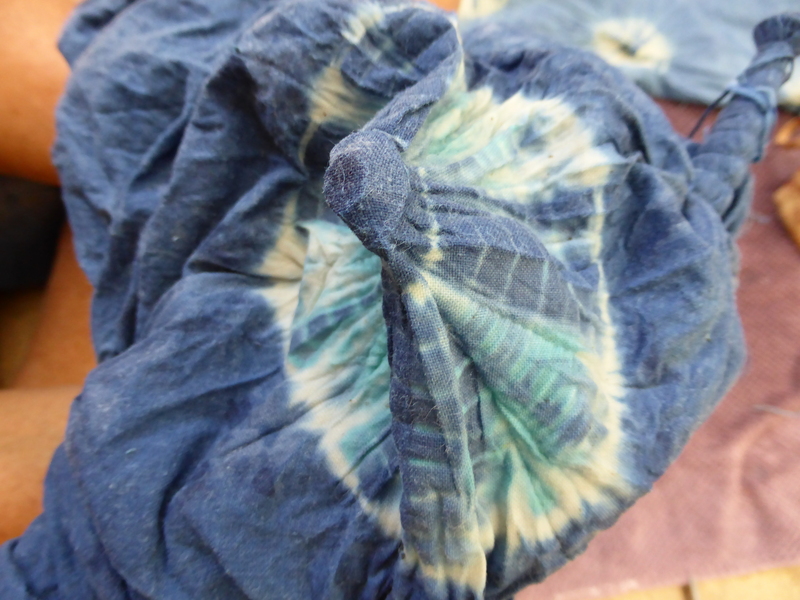 I used a cold pad batch dye made in my state for this process, so I mixed up dye the night before and then put damp braids into plastic bags ready to be dyed… and poured on the colours. 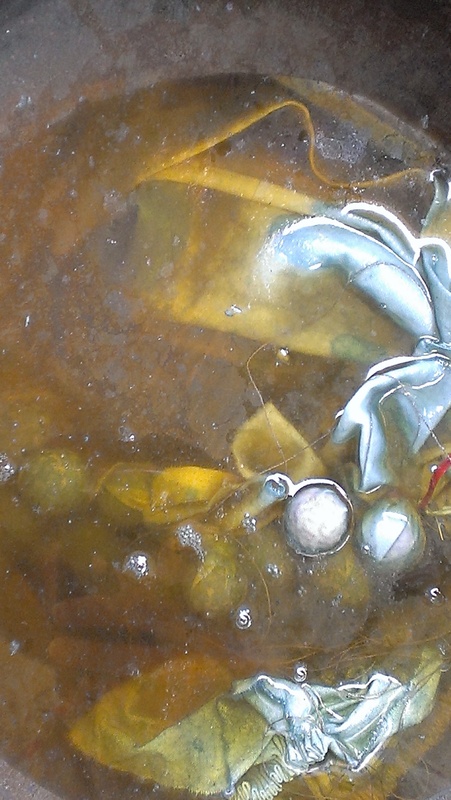 Then–silk hankies and silk noil got the treatment. 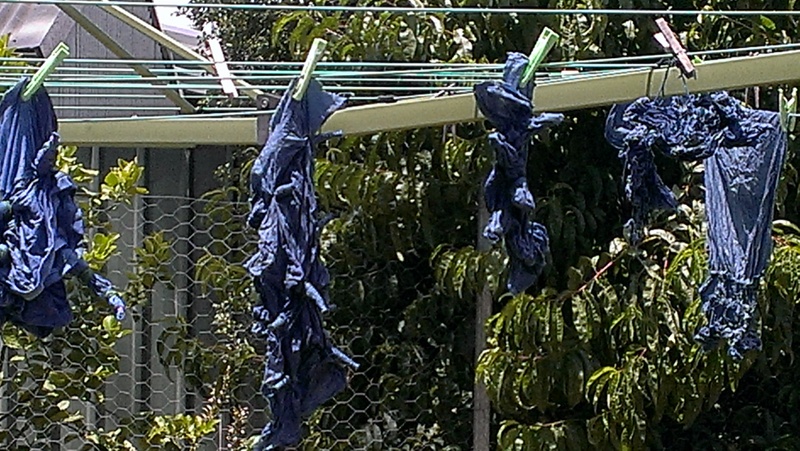 My many bags of fibre and dye went into the sun for a 44C day or two before being rinsed. My stash of plastic bags unsuitable for other re-uses (and ditto for rubber bands and all kinds of saved-up stuff)–came into handy at last, along with virtually every bucket I possess! 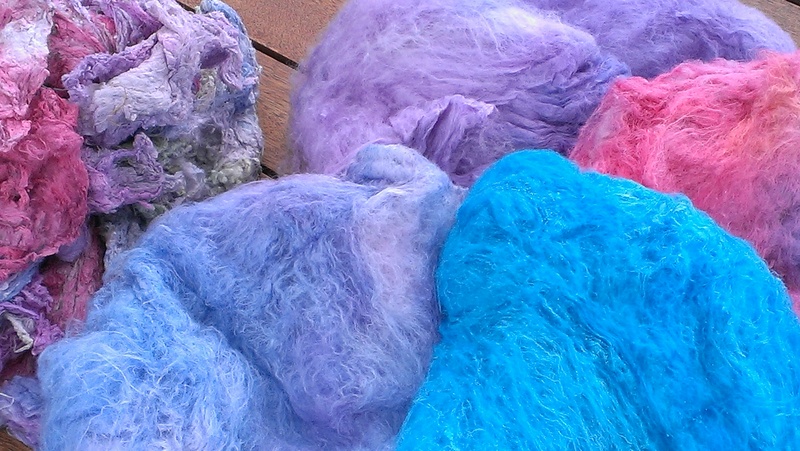 The silk hankies and noil came out rather pastel shades, which was a real surprise. And the braids came out wonderfully well. 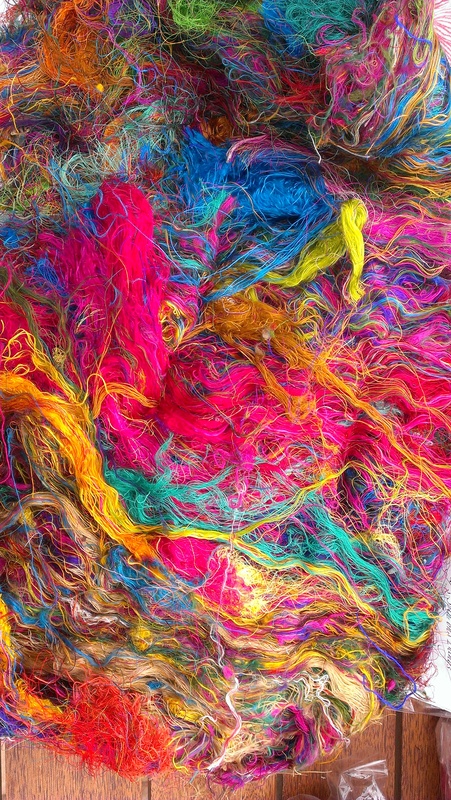 Certainly more than enough fibre here for my workshop participants to be able to revel in playing with colour, texture and technique. The indigo vats got another look with a view to exhausting them a couple of days after the recent big event. I prepared a little more fabric (ah, holidays). The fructose vat seemed in order but I thought it might be exhausted. The first dip confirmed this. Well, we’ve been discussing this in the comments… but this was the conclusion I drew on the day. 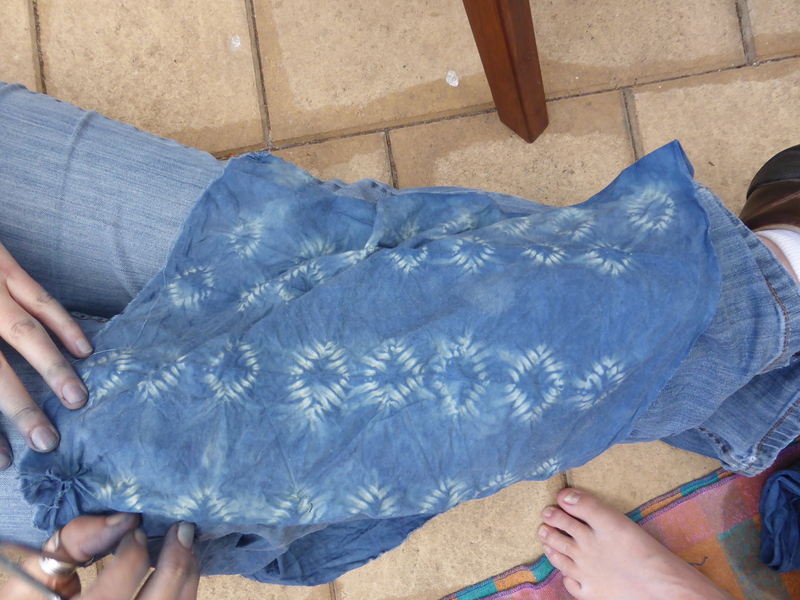 The fabric was very pale even when wet. Reheating and adjusting Ph and adding more colour run remover produced spectacular results on the colour run remover vats. I adjusted the Ph for one vat to suit cellulose fibres and re-dipped my calico samples several times. 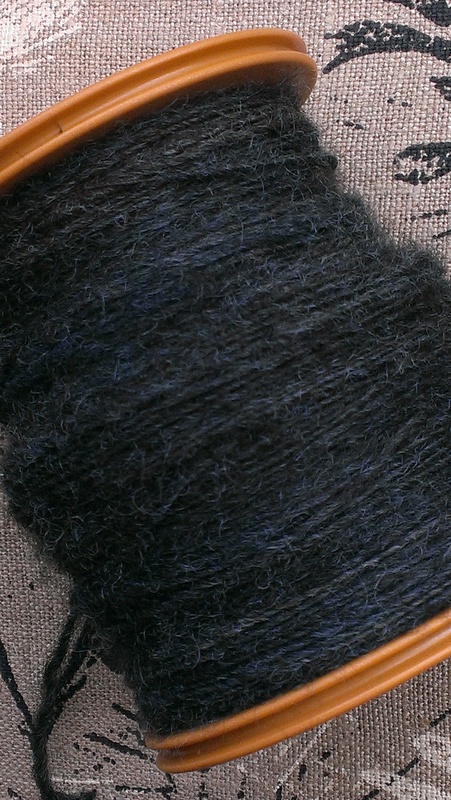 The other I adjusted to suit wool. In with some pale, spotted polwarth (cream and tan). 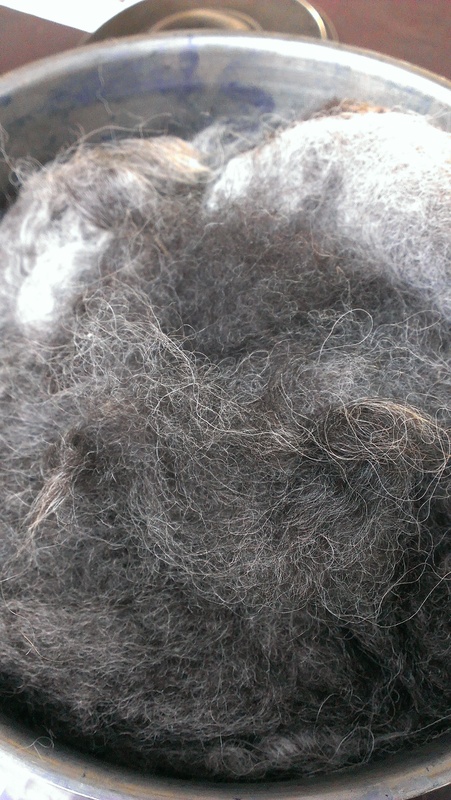 There still seemed to be colour left in the vat so I entered a lot of grey crossbred fleece. The last, overlooked bag of Macchiato the Mongrel. I think he was named a mongrel partly because, you know, crossbred. 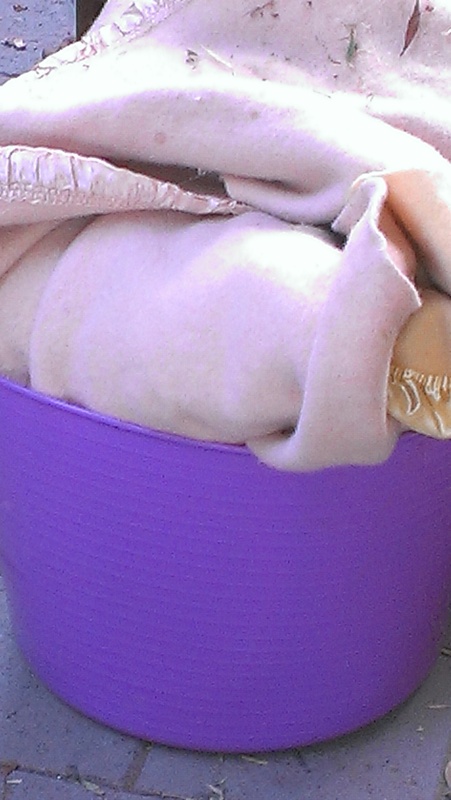 And partly because he ate the neighbour’s pea crop and had to be found a new home. Thus capturing both meanings of this word in Australia. I’ve been spinning the deep blue result with delight since. 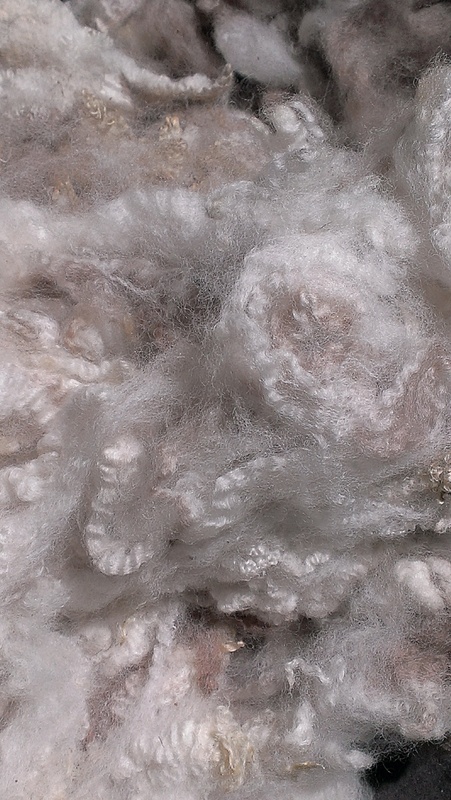 This is quite a coarse fleece, but I have just loved spinning every bit of it, and one of Macchiato’s humans brought me another fleece a while back… so once I’ve washed it, I can go again with all that pleasure. Most of the first fleece went to a friend of my beloved’s who wanted to knit a jumper from it. I don’t know whether she ever did, though! 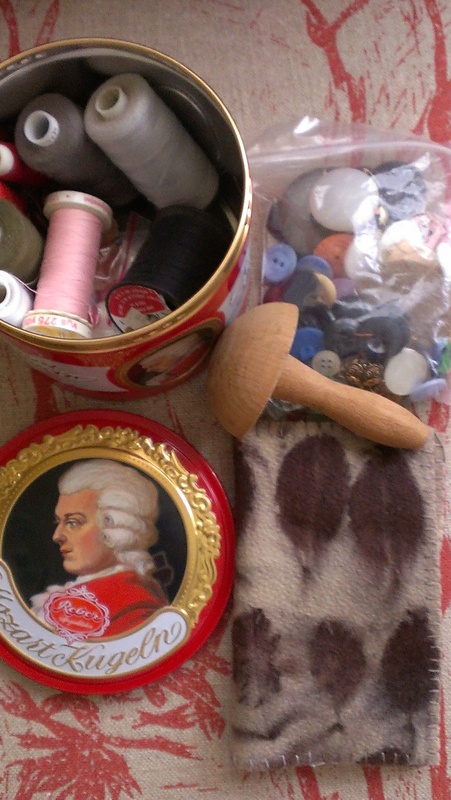 On a visit to relatives not so long ago, I discovered that an entire family were depending on a single tin of buttons and needles and thread for mending. 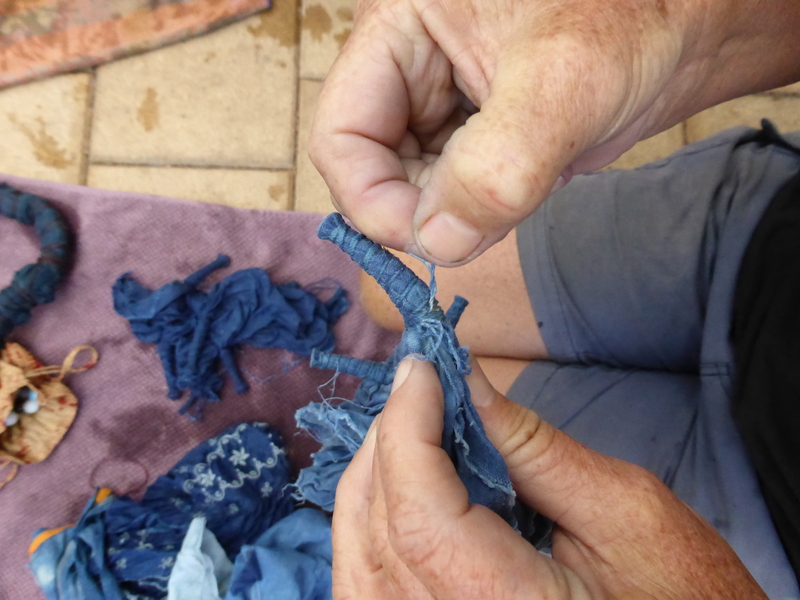 When we visited, I was called on to assist in mending and when the tin could not be found–repairs could not be made. I decided that this was not good enough. So when we got home, I made up two mending kits to add to the family resources, as two members of the family are reaching the fledging stage of life. 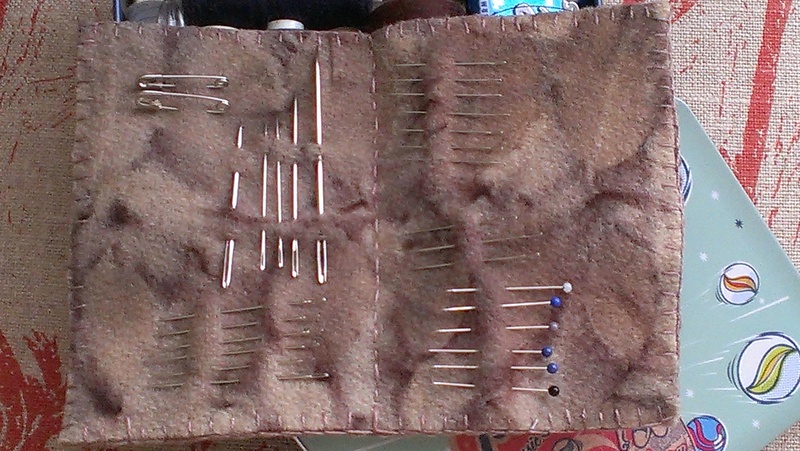 Each comes with a Pohutukawa-leaf needle case, a seam ripper, thread, buttons, and a few other basics. Pohutukawa (Metrosideros excelsa) is native to Aotearoa/New Zealand and widely grown in Australia. 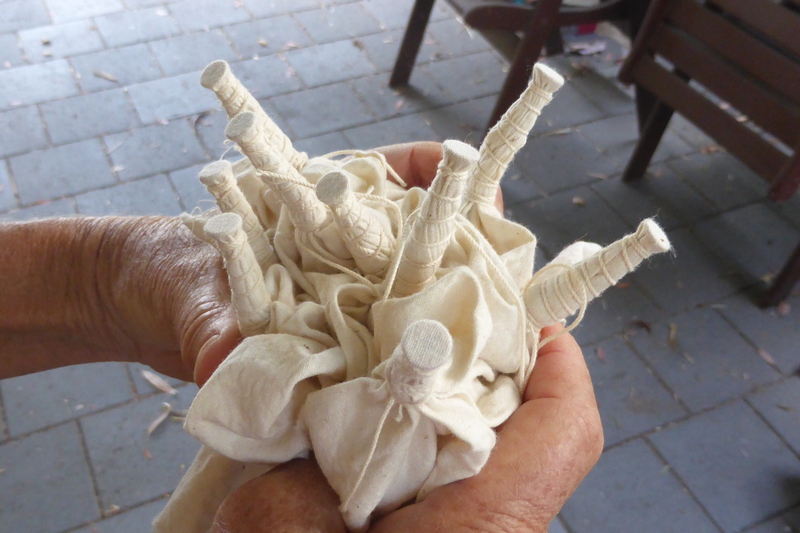 Here is the interior view of one of the needle case. 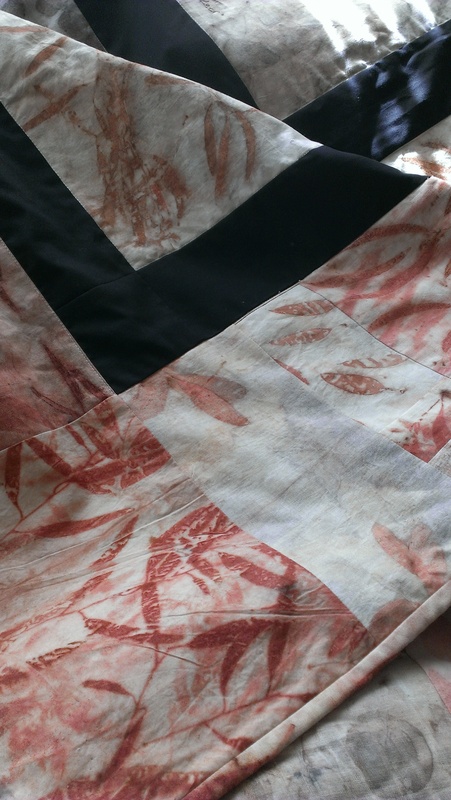 They are simple: two layers of leaf-printed wool blanketing, blanket-stitched together. 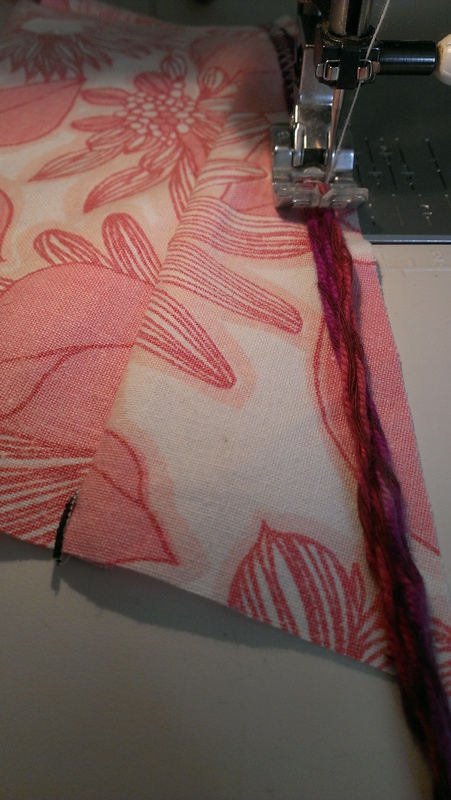 The leaves gave completely different prints on each side, so the outside of the needle case is one side of the leaf and the inside is a print from the other side. This kit makes use of a tin left behind by recent Austrian visitors. It contained a rather delicious Austrian chocolate covered delicacy, but not for long! I’m delighted to find the next use for this tin. This kit was big enough to also fit a pre-loved darning mushroom. These little kits have found their way to their new homes by mail–I received a text message of thanks today. 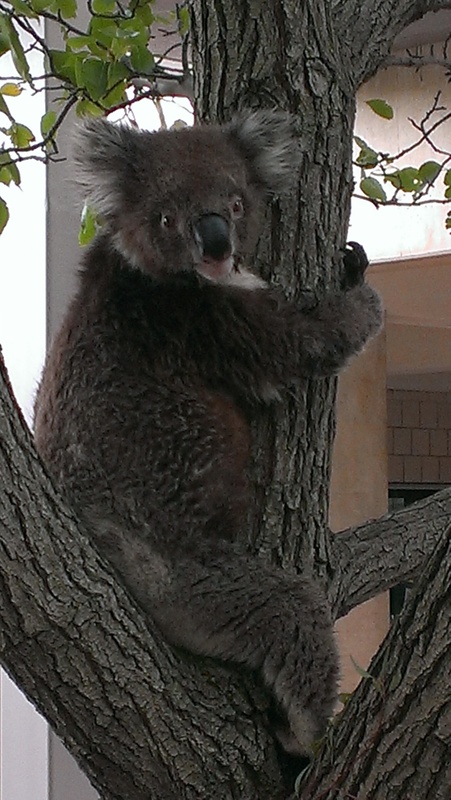 And now, I’ll finish on a gratuitous koala picture. The appearance of this amazing creature on a Manchurian pear tree at my place of work is not a good sign. It arrived in a period of extreme heat and little rainfall, no doubt seeking water (and fame, I’m sure–in the bush, koalas are much further away and very hard to photograph effectively–JOKE!). Over the years a koala has turned up in this spot once in a while–presumably the same one–and water is provided. 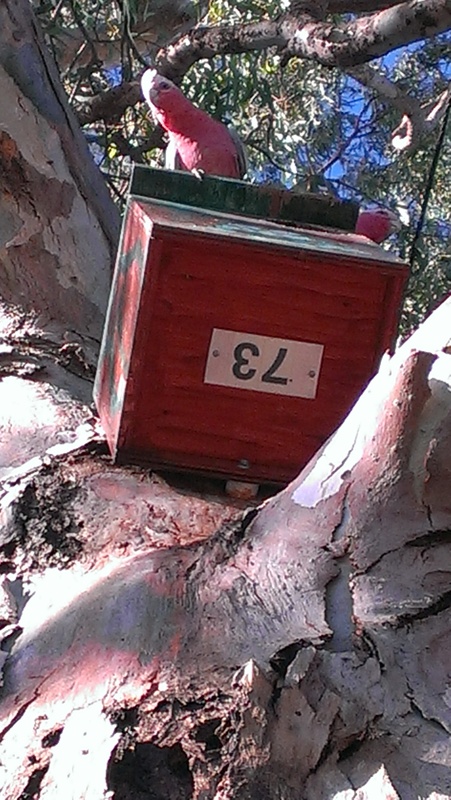 In a day or two, it heads back to the nearby eucalypts, since koalas have a very narrow dietary range. Sometimes one or two can be sighted from a glass walkway up on the second floor, hanging out in the treetops, to equal fascination on the part of passing humans. Enjoy! 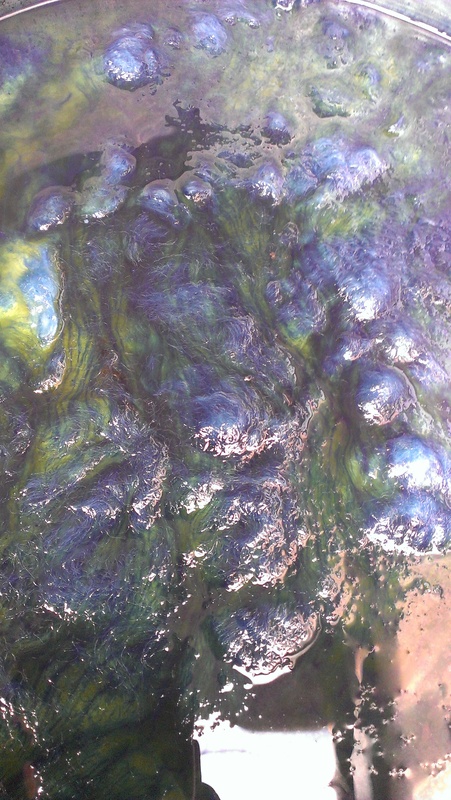 One of the fun things about doing a vat dye is watching the transformation through its many stages. 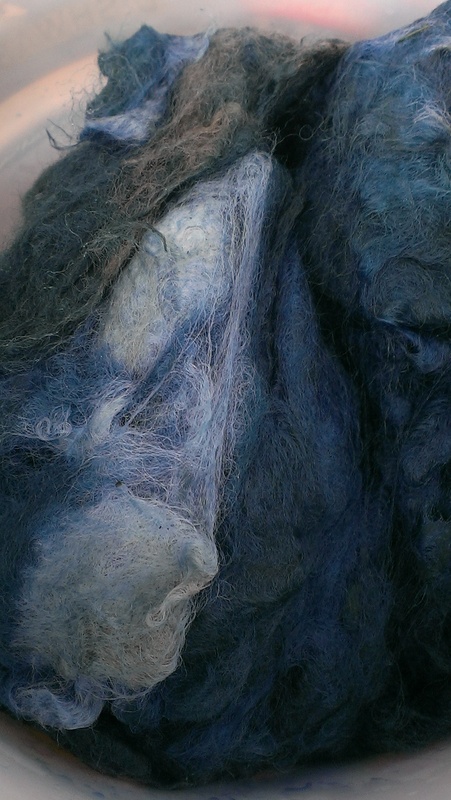 With indigo, even more so–because of the magical qualities of the dye–yellow while in solution in the vat but turning blue as soon as the fibre enters the air and oxygen reaches it, paired with the process involving multiple dips to build up depth of shade. Given my friend’s generosity with the camera, here are a few efforts to follow specific items through the process. 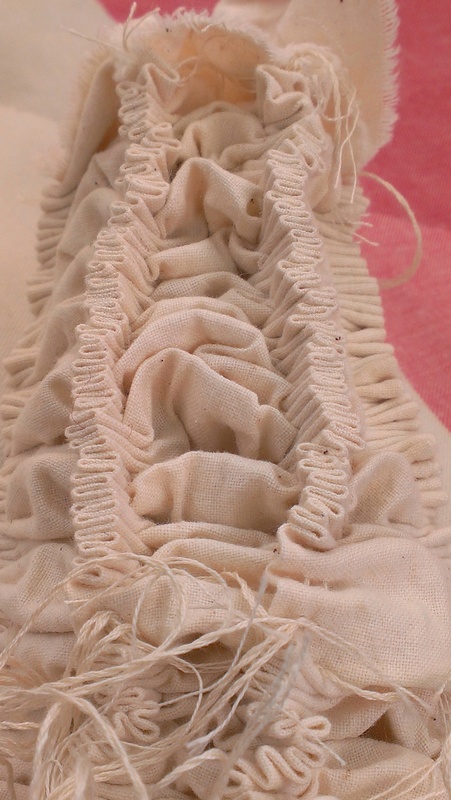 There was a spectacular effect when they were untied–but it was temporary–the binding was so tight that air hadn’t reached the inside pleats despite rinsing and time on the line! So, given that all indigo vats are going to be learning experiences for me, possibly for the rest of my life… what did I notice and what did I learn? Preparation of the fructose vat a day earlier worked well and this experience gave me confidence to try this process again and keep experimenting. This time, I tried to hold onto what I learned from the last one: to trust my judgment about when to stop. I am a beginner at this process. But, limited as it is, my judgment is what I currently have, and judgment is there to be developed. In my experience as a teacher, judgment is one of the most difficult, yet most important, things to acquire–but at least in dyeing the repercussions of poor judgment are more limited than in an operating theatre or a court! This time, no evidence of crocking. Some things were pale blue even after several dips. All of the calico items that went into the fructose vat, for instance. I like the colour, but had not expected this. I noticed that most of the items that only went into the fructose vat remained pale shades. 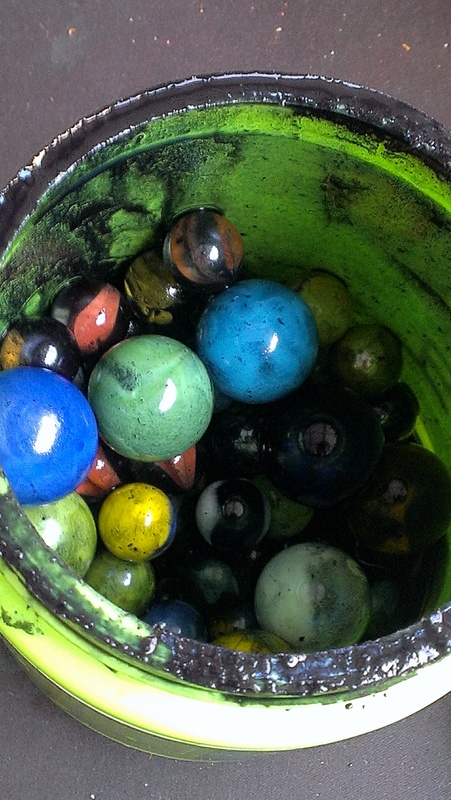 Some went from there to the colour run remover process when the fructose vat needed a rest–they were deeper. 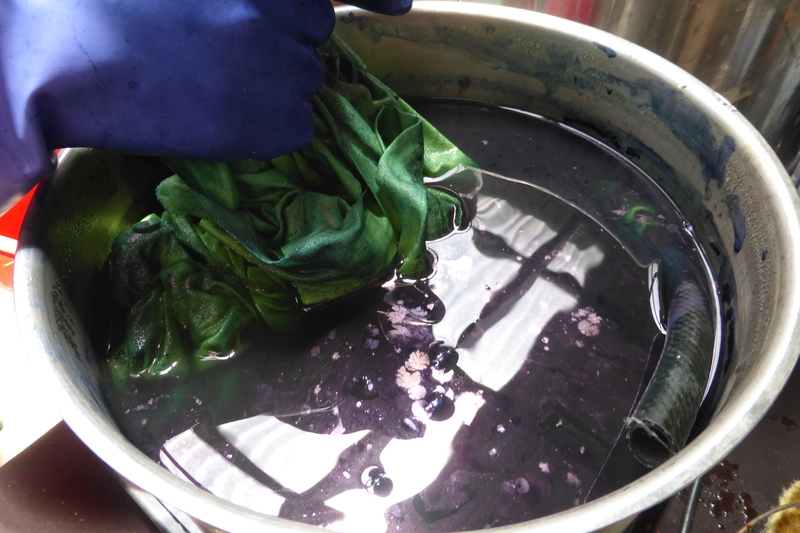 This might have been because the natural indigo in the fructose vat gave a different outcome to the synthetic indigo in the colour run remover vats. 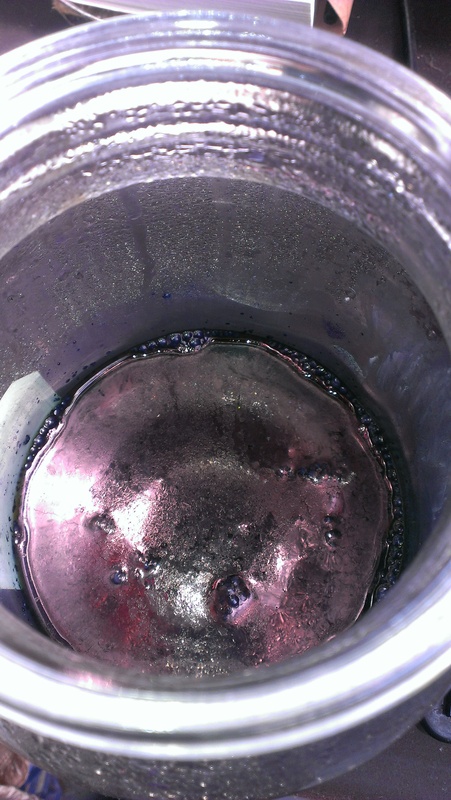 It might have been due to the difference in processes or some failure of my understanding of the fructose process resulting in the oxygen not being sufficiently removed from the vat–though the colour of the vat was good. It now occurs to me that I could have tested this by adding hydrosulphite to the exhaust of the fructose vat when I really couldn’t get much colour from it two days later. Next time? 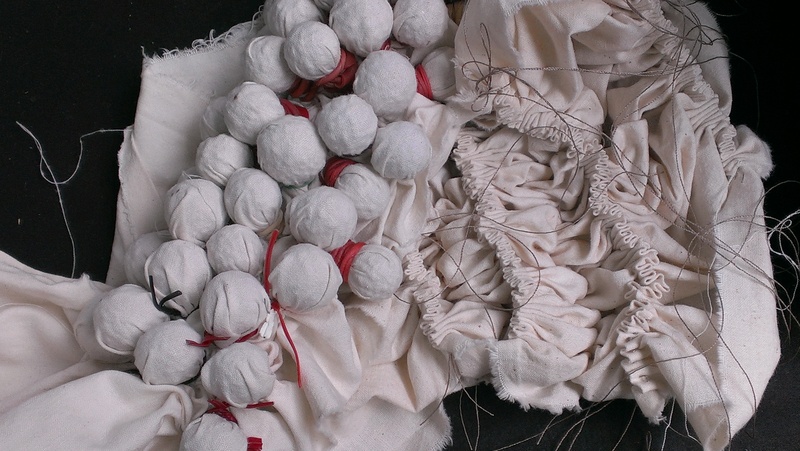 It might have meant the calico had a treatment that resisted dyeing–but other fabrics also came out pale. 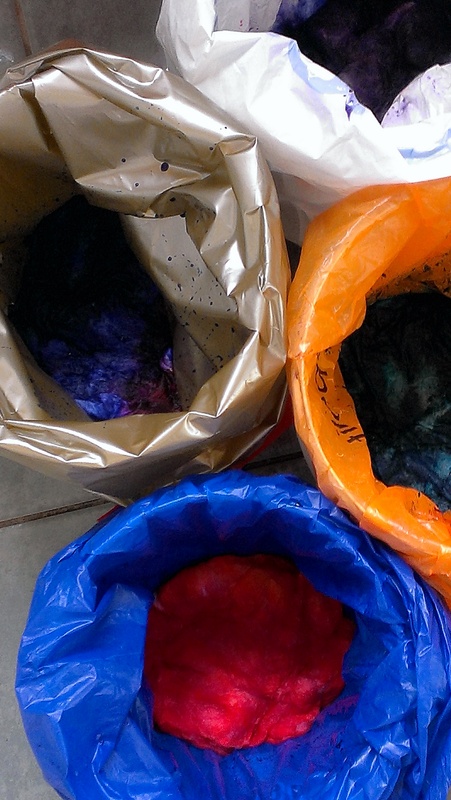 We did dye a LOT of materials–and perhaps the fructose vat ran low on indigo. 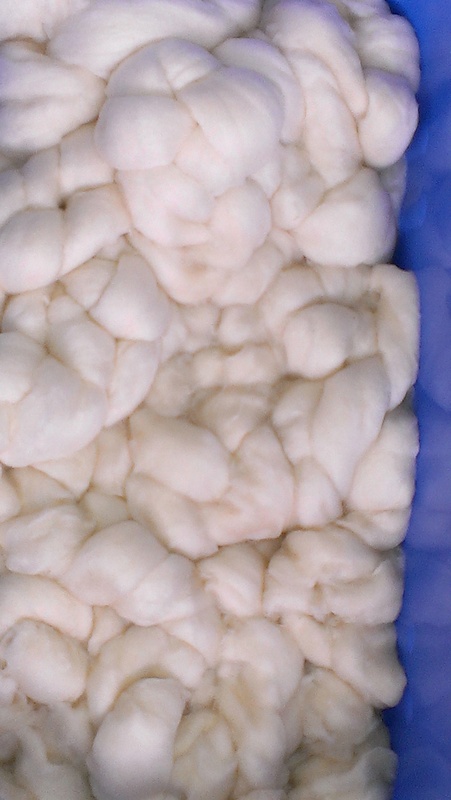 It was in a bigger container so may have received more fabric (and more oxygen). 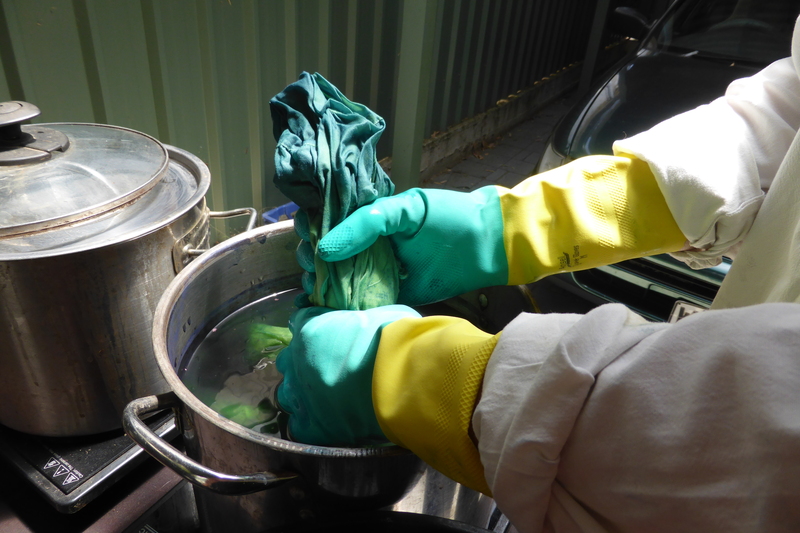 But I had an exhaust vat extravaganza two days later and the colour run remover vats still gave colour–one in particular dyed quite a quantity of wool (after adjustment of the Ph to a level more suitable for protein fibres). 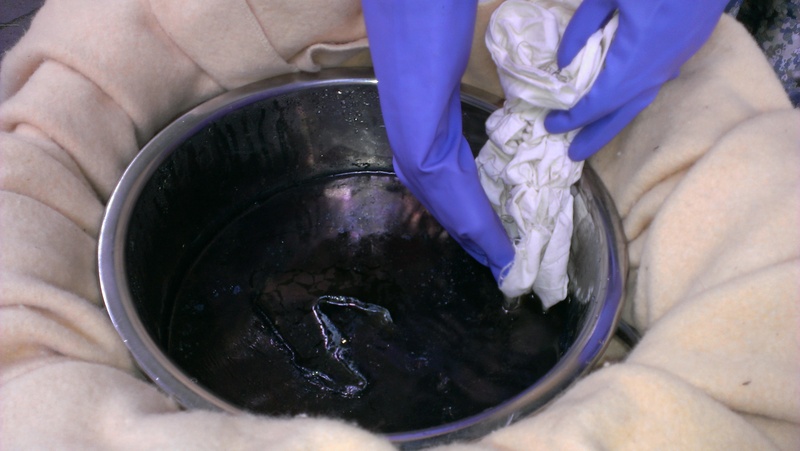 Mmm… the indigo vat curiosity and the love continue… here, the fructose vat gets a cuddle as it warmly rests. 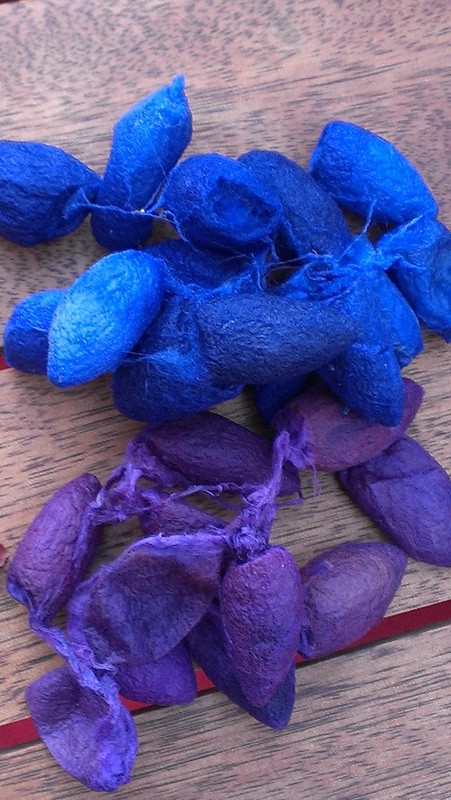 We practised our skills at getting fabric into and out of the dye without adding needless oxygen. This time I had a dependable thermometer and used it! There wasn’t just the fructose vat. 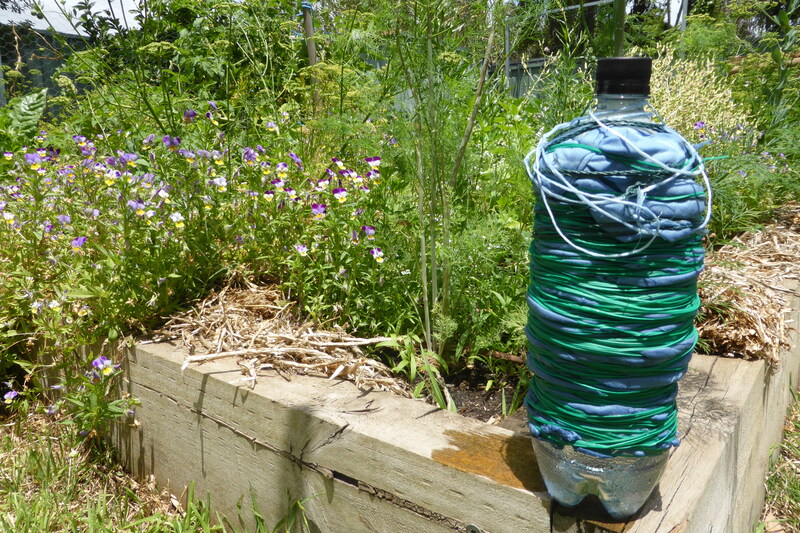 I have decided that aiming for fermentation and fructose vats is a good long term goal for environmental, health and all kinds of other reasons (pure curiosity, for a start…) and I am growing woad and indigofera australis and Japanese indigo. 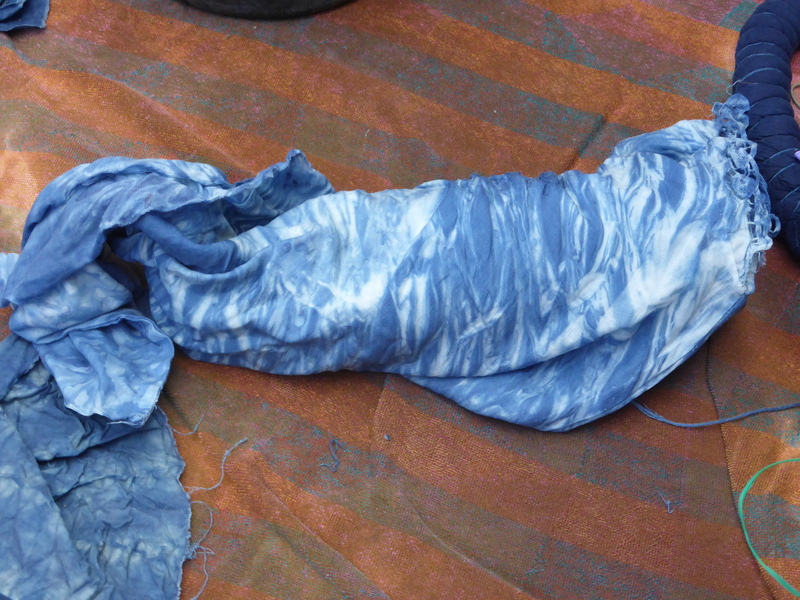 However, I have decided that in the interim, colour run remover (mostly sodium hydrosulphite) can rescue failures in my judgment and experience and save wastage of indigo. 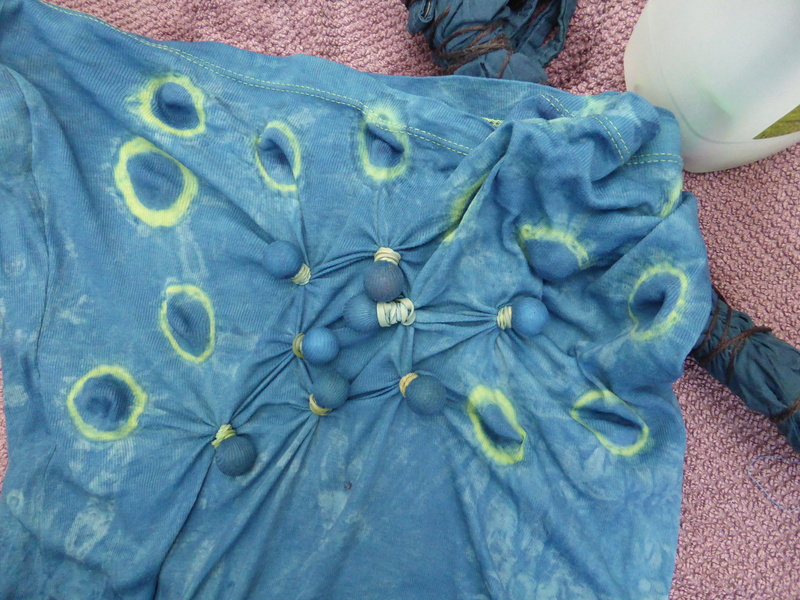 Since I have some synthetic indigo, I decided to use that in any hydrosulphite vats as it may not be so suitable for fermentation or fructose vats. 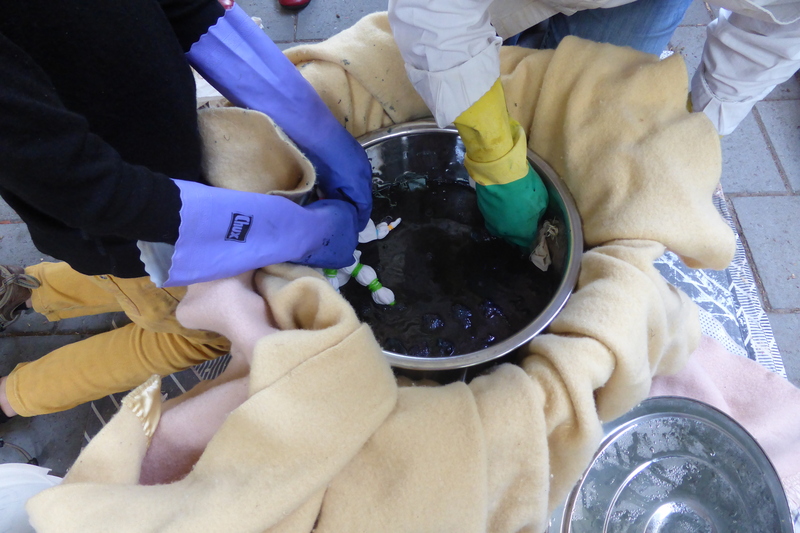 There was a lot of fabric when everyone piled in–so I set up two hydrosulphite vats and was delighted not to need to use hydrosulphite to troubleshoot the fructose vat. 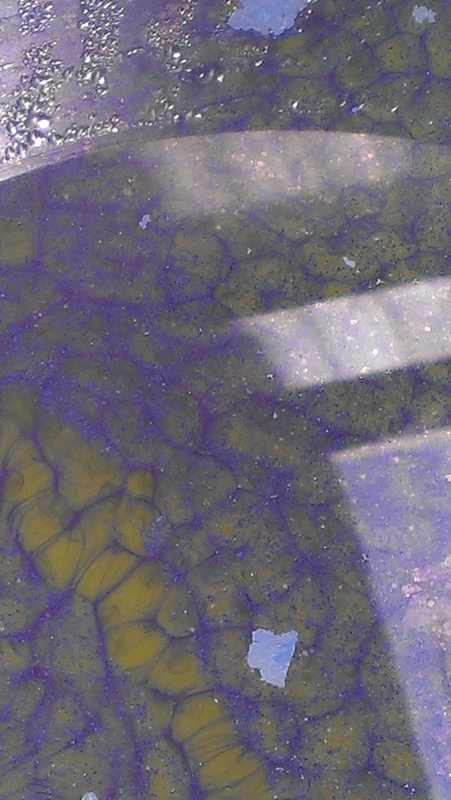 This is something-or-other coming out of one colour run remover vat quite yellow and beginning to turn blue as the air strikes it. 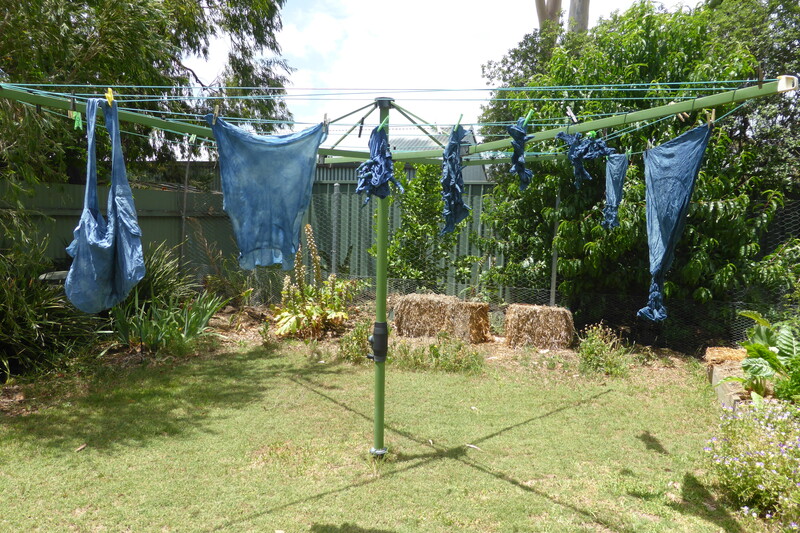 For these vats, I tried Jenny Dean’s recipe for a colour run remover indigo vat from Wild Colour. 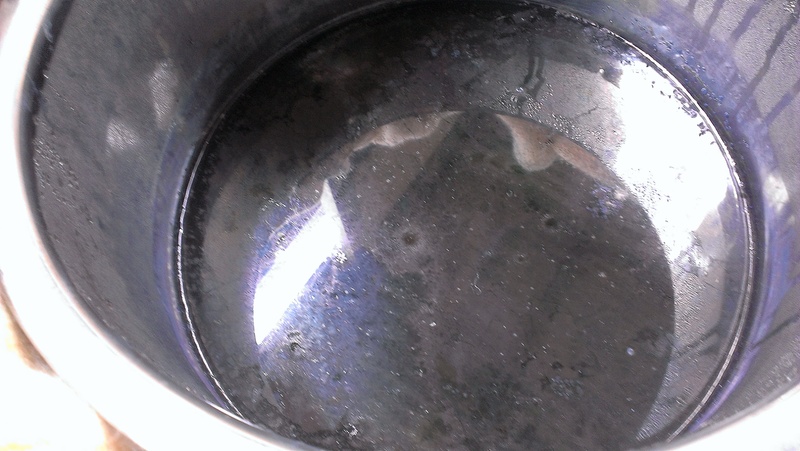 It worked really well and uses washing soda, a much milder alkali than some proposed in other books. 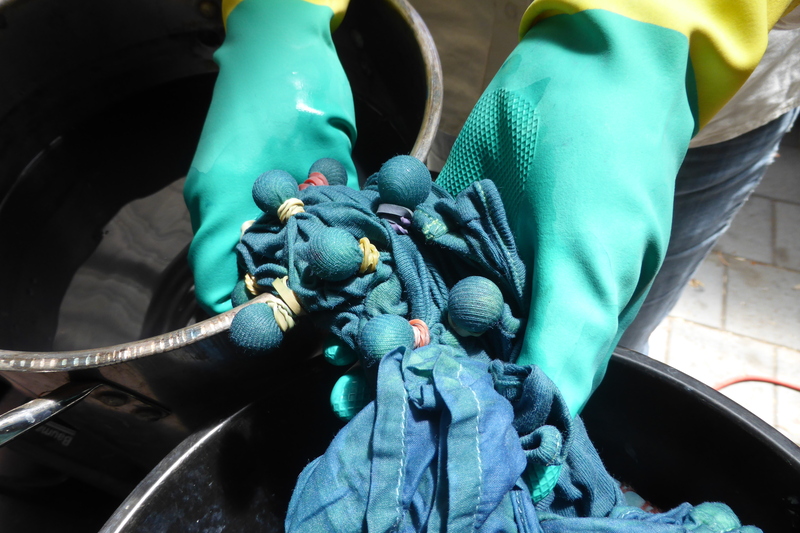 It’s also designed for colour run remover and not pure hydrosulphite–and that is what I had. The fructose vat smells MUCH better! I love this process of transformation! The best item of all for this effect was a pair of pants tied around a length of garden hose. 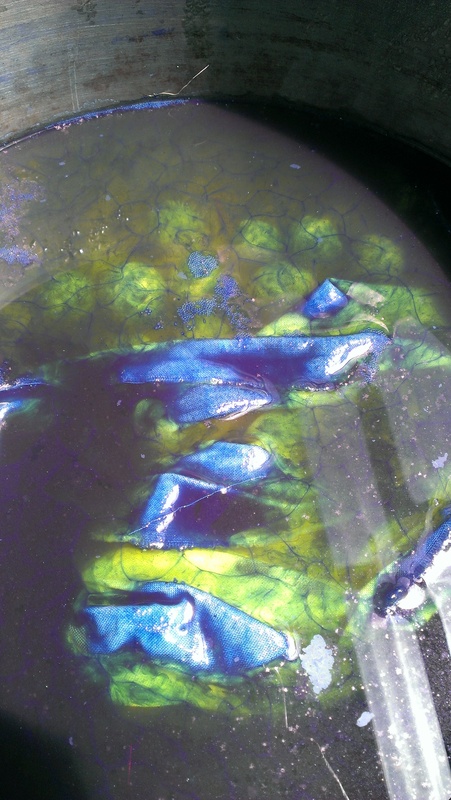 It was long enough to be yellow at one end, green in the middle and various shades of blue as it slowly emerged from the pot. 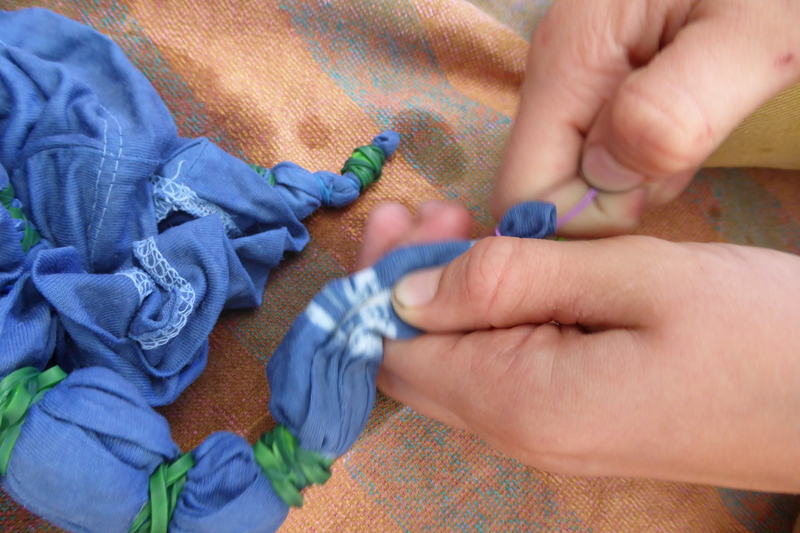 My friends had been out researching techniques for resist–so there was stitching, wrapping, bundling, string, thread, rubber bands–and even wax resist, some applied with a biscuit cutter and some freehand. 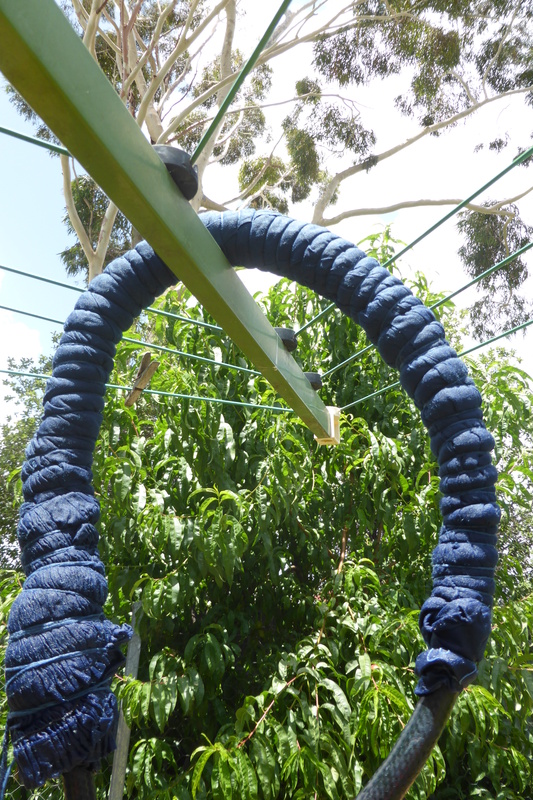 With three vats going, and regular monitoring of temperature and Ph and so on, the scene at the clothes line kept changing. 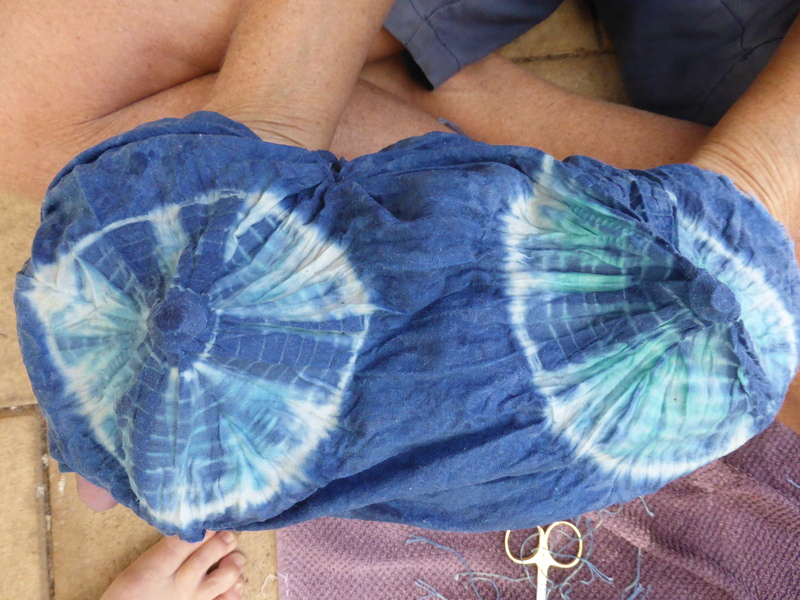 There were whole-garment makeovers, a purpose made bag, scrap fabrics, an opportunistic bag makeover and the pieces for a pair of pants yet to be made. 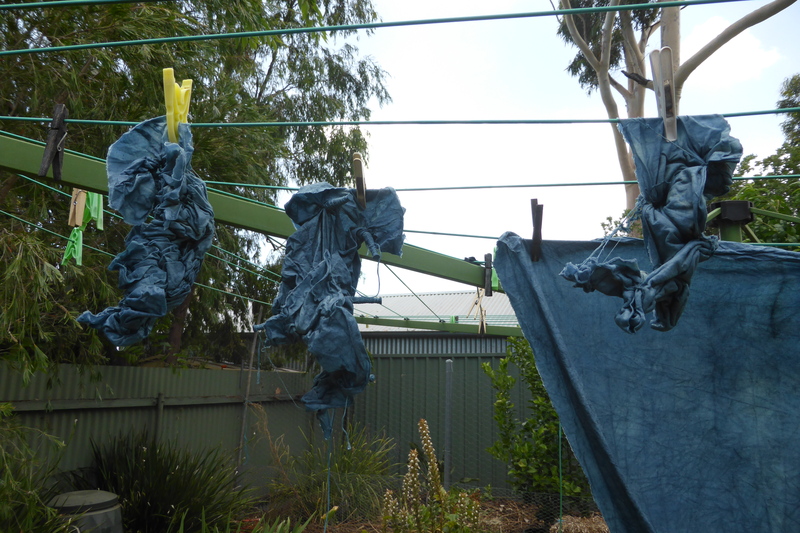 The shades kept changing–wet to dry and dip to dip. …Until finally we had done all we could do and time to head to our various homes started to arrive. 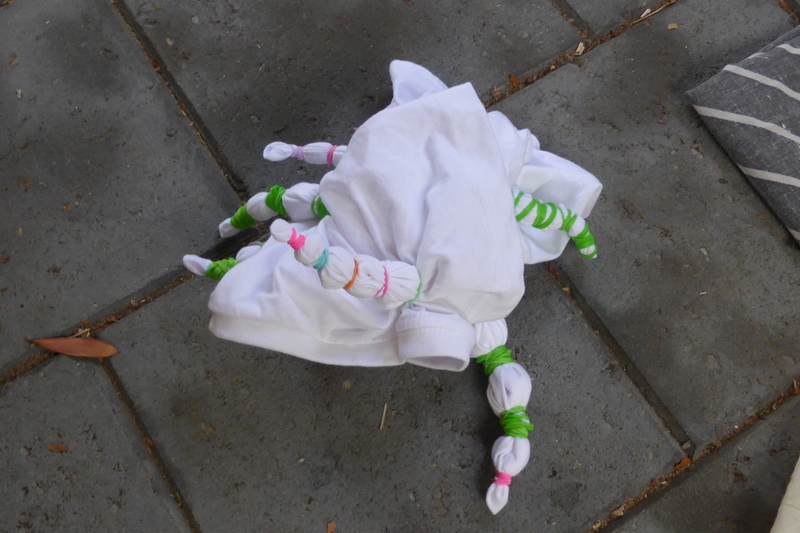 Then there was a lot of undoing and exclaiming… and I’ll save that for another post! 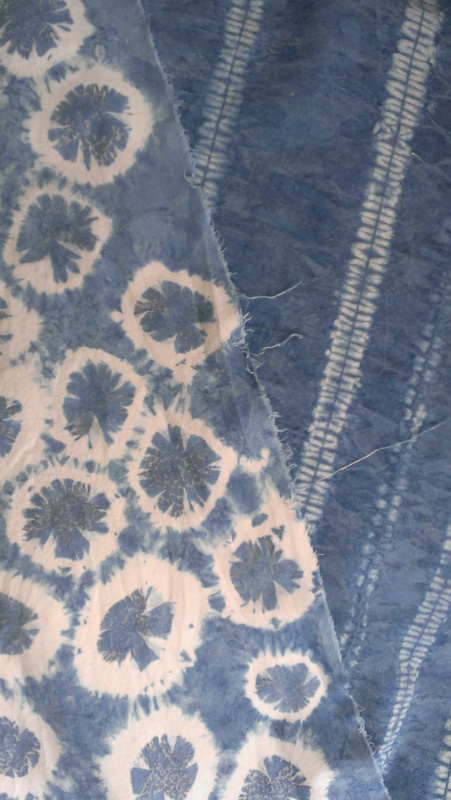 I’ve had indigo on my mind (oh, and on my fingers, too!). 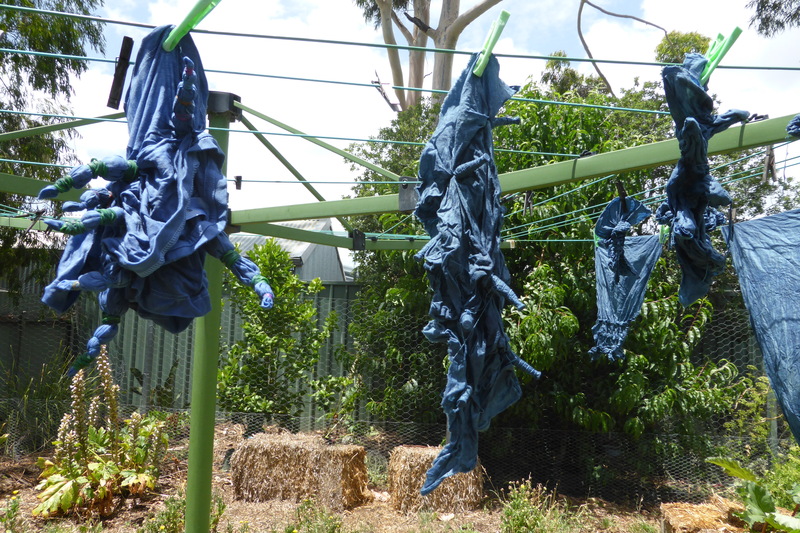 I’d been planning a summer indigo dyeing day with a bunch of locals–and there are folk at the Guild who want to try indigo too. I was keen to try the fructose vat again. 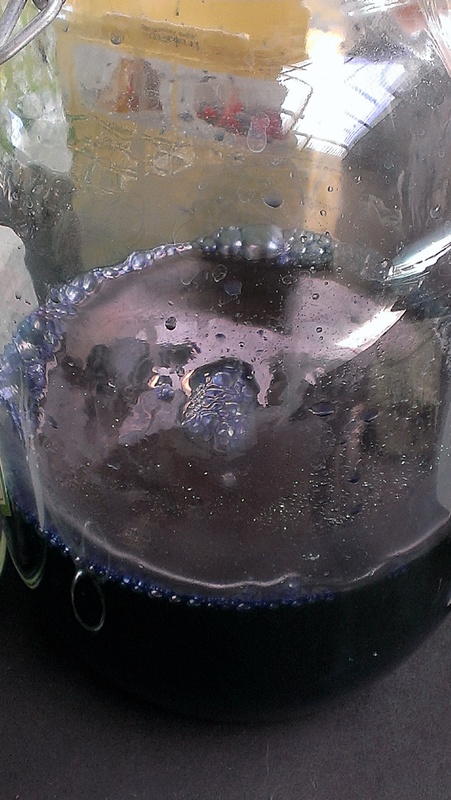 My last experiment with the fructose indigo vat involved some errors on my part… so I decided on treating it (and all other indigo vats) as a learning experience and trying again. 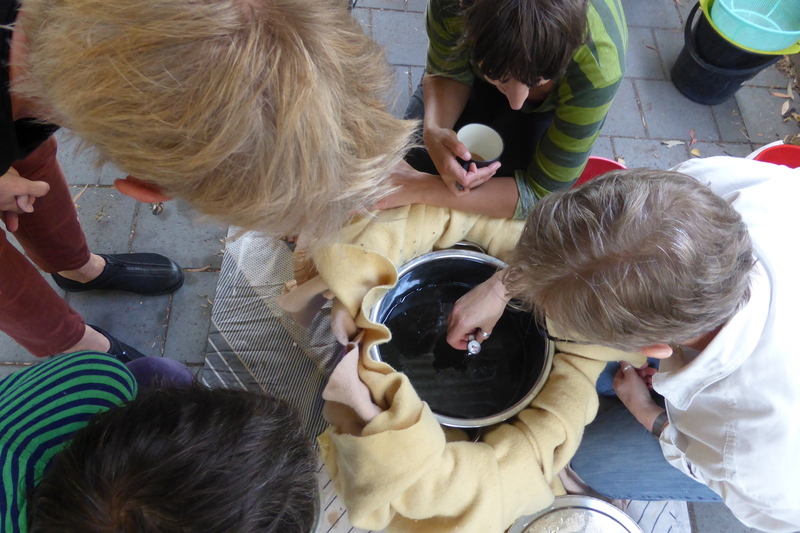 I love the idea of being able to run an indigo vat without using sodium hydrosulphite, and I also love the idea of being able to use local fruit and even the leftovers from jam or other uses of fruit to prepare a vat, thus wasting nothing. This is what the fructose vat has to offer… So, I took up Maiwa’s instruction sheet for Michel Garcia’s fructose vat, and began. I am just so delighted to have access to Michel Garcia’s wisdom on this subject. You can see the instructions as a blog post here or a downloadable pdf here. And then… the magic started! 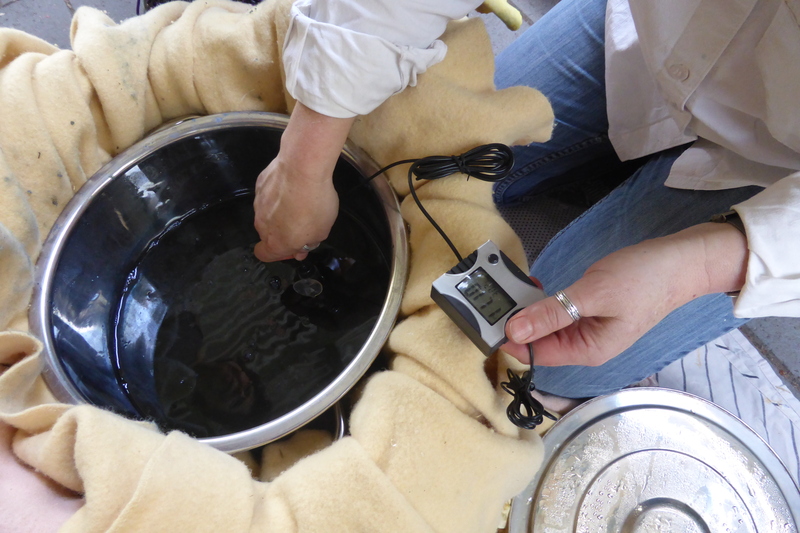 I mixed the starter into the larger vat and then contrived a very sophisticated system for overnight: a very big bucket with a towel and my two woollen dye blankets inside for insulation, then the vat. Wrapped for the night! Next morning… it all looked rather fabulous! 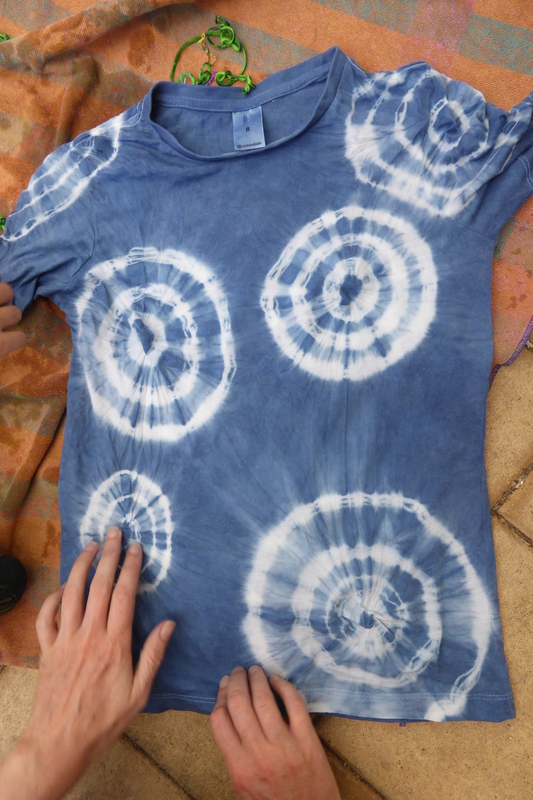 In the meantime, I’d been plying my needle during various festive gatherings. Can you see the half-circles in the half-light? 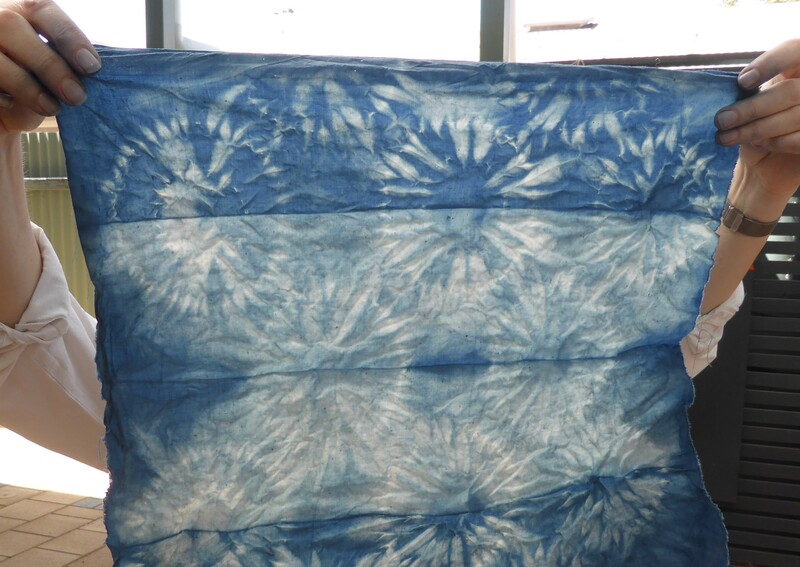 I read Vivien Prideaux’s A Handbook of Indigo Dyeing and tried out some of her ideas in a rather less precise manner than she proposes. 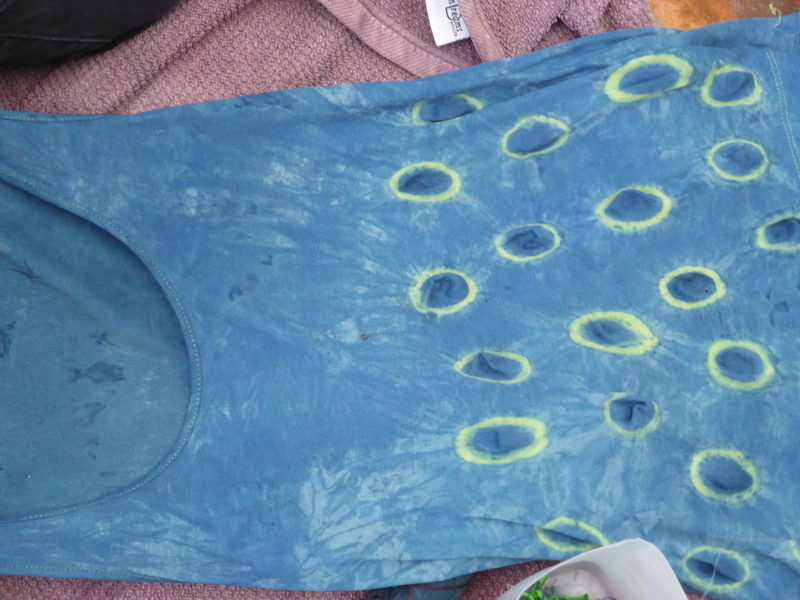 Essentialy, I decided that anything I could prepare to dye in advance was a bonus and precision was the least of my concerns. her ideas were very helpful. 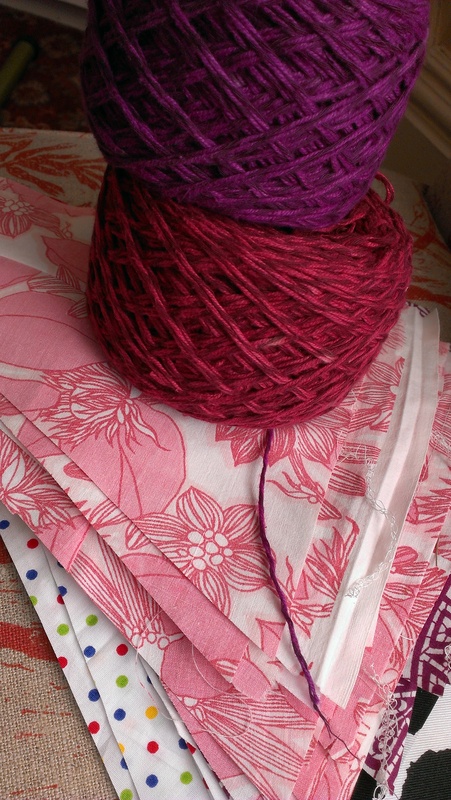 And piled up a little stack of fabric in preparation. 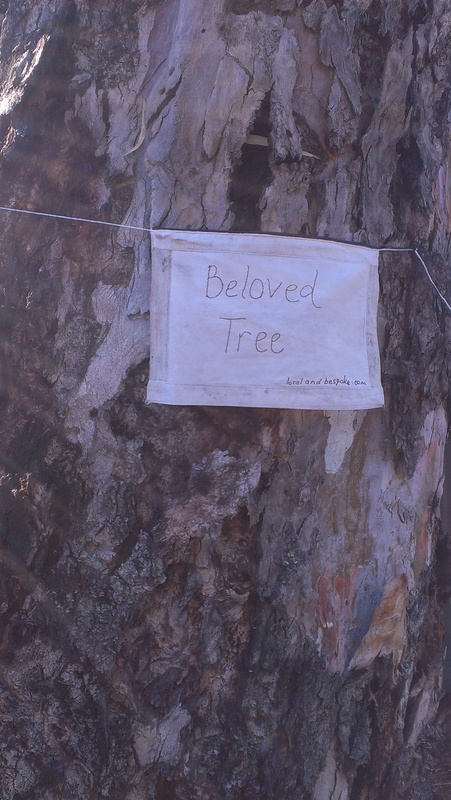 One of my beloved tree banners came down a while back, so I have laundered it and decided to re-apply it. 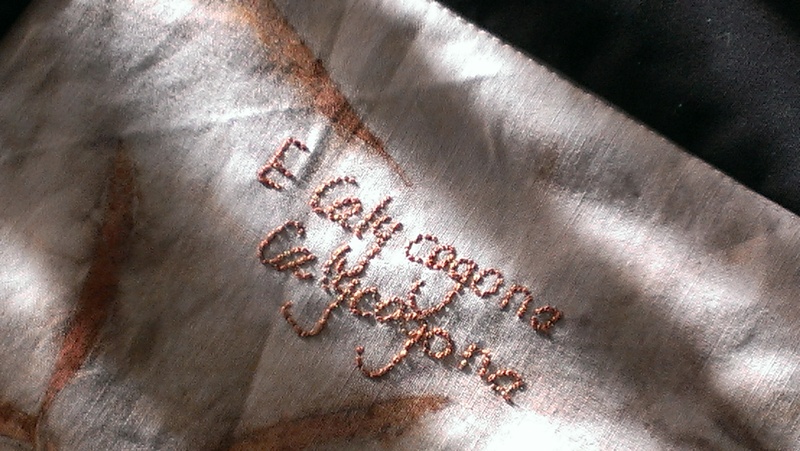 The leaf print border has faded very much over the months it has spent in the full sun and weather, but the eucalyptus dyed silk thread I used to stitch the lettering onto it has remained a good strong colour. As I stood holding string, arms spread wide, I looked up in appreciation of the tree and realised we had supervision, or at least, company! One of the women who was part of the government department managing the infrastructure project that took hundreds of trees from our neighbourhood organised dozens of bird boxes. She negotiated a collaboration between primary school children, who painted the boxes (this one has a frog on it) and scientists, who are studying the birds in our area by checking on these boxes (hence the number on its base). 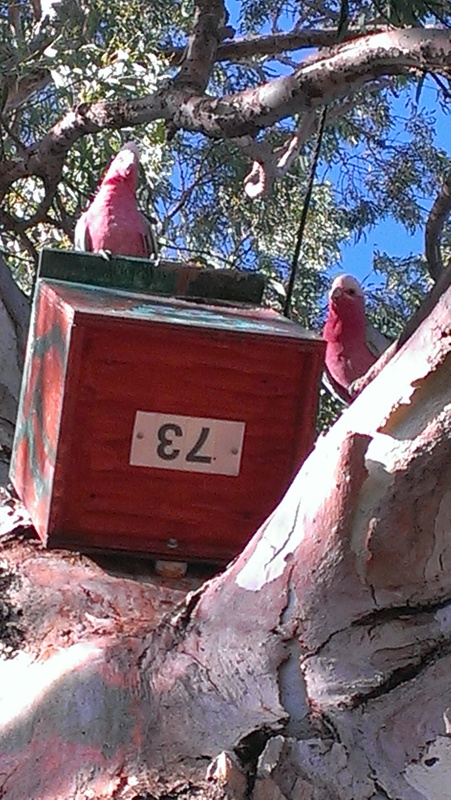 It looks like these galahs have been taking advantage of her foresight and dedication. I had noticed galahs in our neighbourhood, and an even more unusual pair of yellow tailed black cockatoos who have been passing through, but did not realise these galahs might have taken up residence here. Wonderful! So this week I decided to get onto the project. 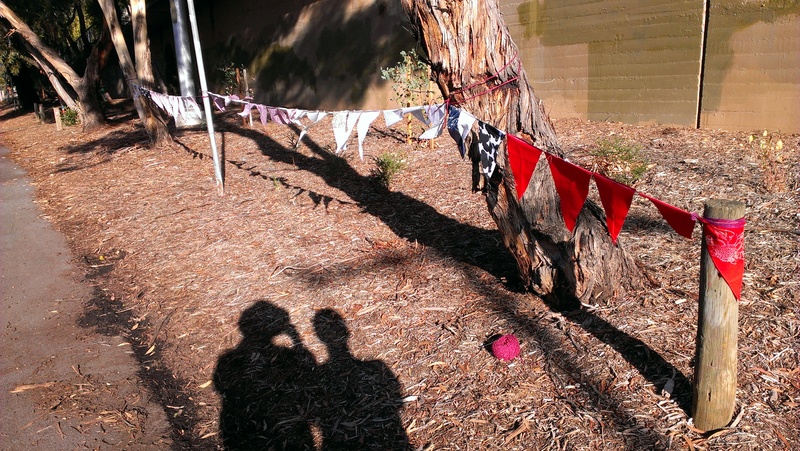 I pulled out the bunting I’d used to protect my plantings in another spot during the royal show, ironed and mended, and when we had fellow plant lovers visiting–all of us went down with tools and gloves and created what I hope will be a friendly reminder that this is a garden and not a parking lot. The ‘no standing’ signs in the next street over haven’t stopped people parking there… but hopefully this will help some of the low growing plants survive to get big enough to be visible from a car and let people know the neighbourhood cares for this patch.